This story really begins where the Pines to Palms adventure ended, on a beach in Oceanside, CA, staring at the pier. 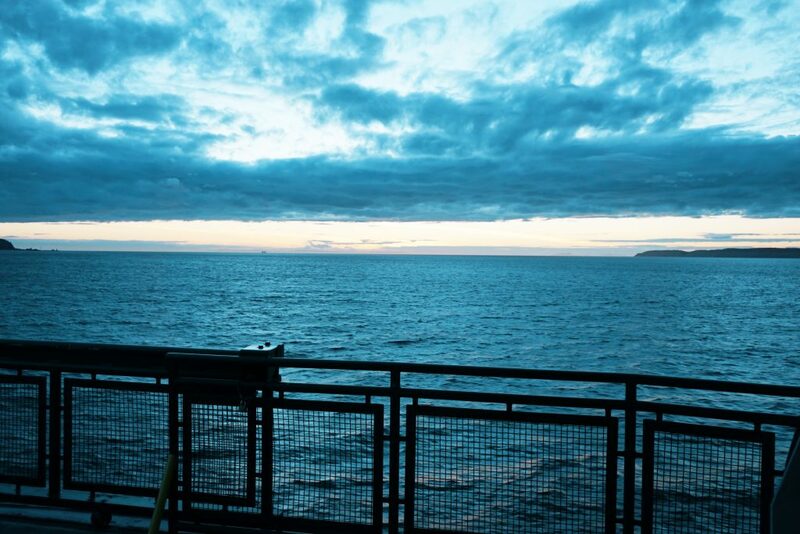 As I sat there gazing out at the ocean, I knew I’d be back, and I knew it would be sooner than later. 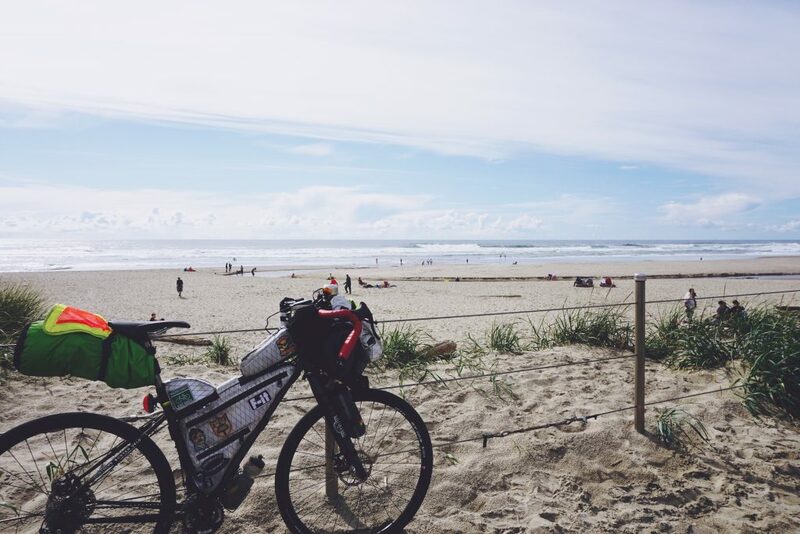 As my trip to Oceanside was winding down, another riding buddy from Illinois, Mark MacKenzie, had shared a Facebook post by Blackburn Design, looking for sponsorship candidates to ride either the Tour Divide or the Pacific Coast. The Divide has always been a goal, but I wasn’t yet convinced I could make it through that terrain for 2700 miles. I have always been the one to learn in increments, and push a little farther each time. The Pacific Coast seemed like the perfect stepping stone to prepare for an even more difficult adventure the next go round. 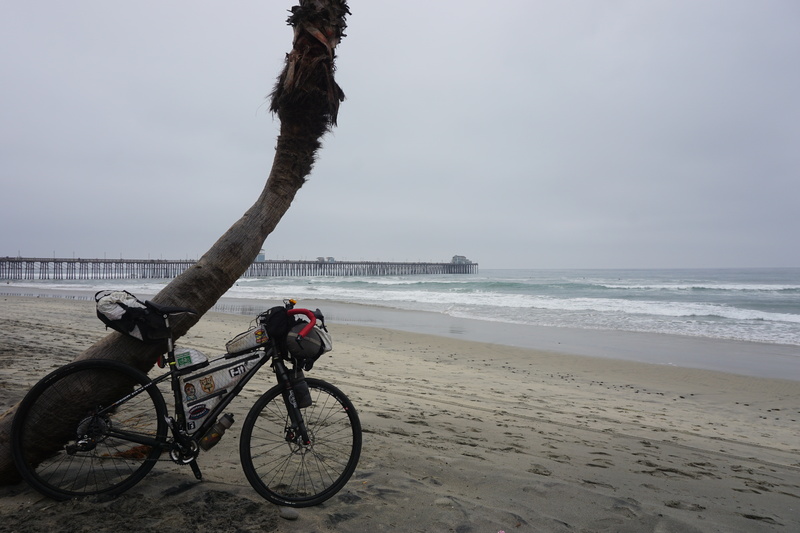 Upon returning from Oceanside, I began researching what it would take to get from Vancouver to Imperial Beach. How can I take two weeks off work, how can I afford a plane ticket, where will I stay every night, how far can I ride each day, what will I eat, how much gear should I bring? A million questions, doubts, and fears run through your mind when sorting out the most daunting task of your life. The first concern to begin tackling was funding the adventure. 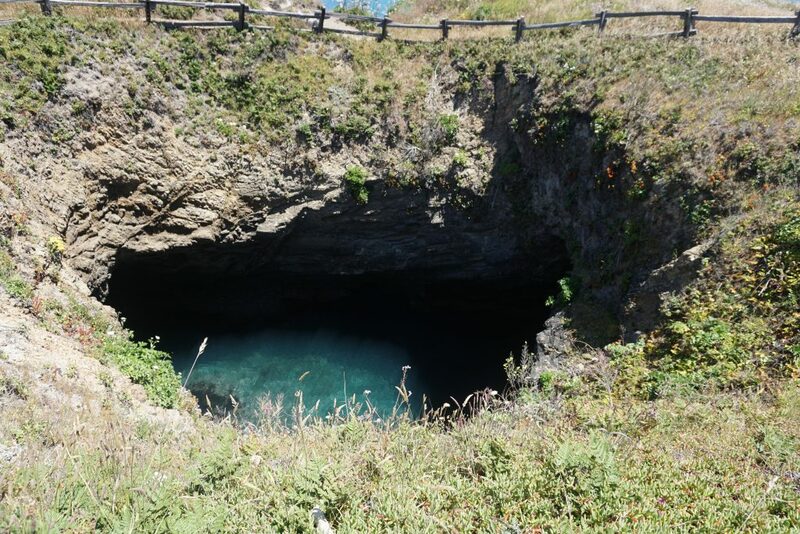 I had considered a Go-Fund-Me account to pay for the trip, but I didn’t want to take people’s money, I would much rather offer something in return. I got to test out my design skills and created jerseys, caps, and t-shirts that I could turn a little profit on to pay for the trip. Thanks again to all who purchased any items from me, I couldn’t have done this without you. Paying for the trip was probably the easiest task to sort out, the logistics of the whole thing is what I would pour over for months to come. 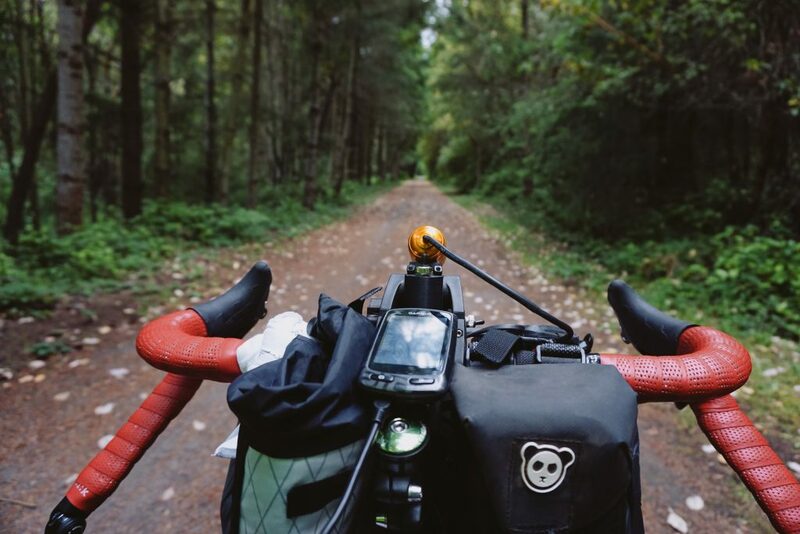 The Adventure Cycling Association has mapped out long distance touring routes all over the US. They had a paper map for the Pacific Coast Route, but I’m too tech for paper. Instead, I began scouring the internet for a GPX file I could drop onto my Garmin. Eventually, I stumbled upon a route, not quite the same as the ACA’s, it added a bit more miles and even better, more climbing! For days, I poured over a zoomed in image of the map, finding and researching every possible campground. 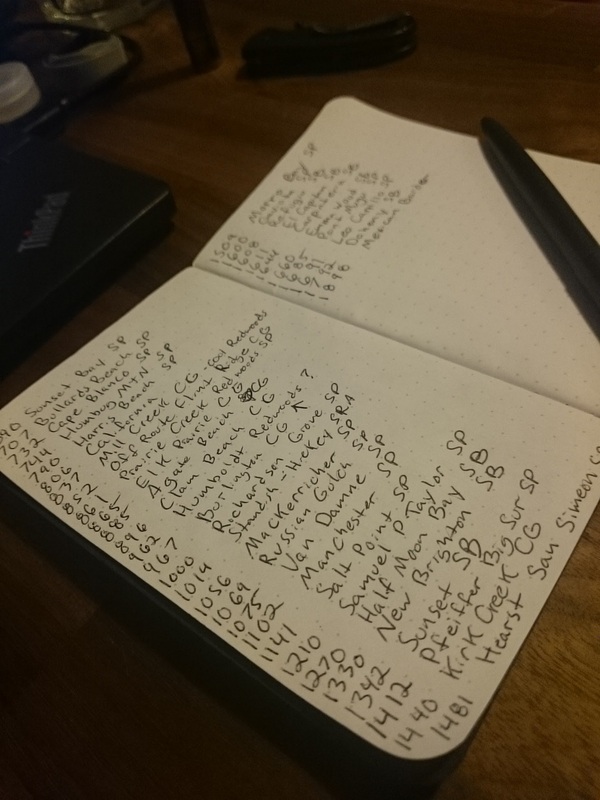 I made a list of all the potential campgrounds and their estimated mileage points on the route. My only worries were if there were road closures or detours, but I could likely figure those out along the way. After the route was sorted, I broke it down into 100-mile sections and loaded up the Garmin. I am embarrassed to say, but this would be my first time traveling out of the country and I didn’t have a passport. The clock was ticking and I ended up having to use the express option to guarantee delivery by departure. Booking the flight was easy and a pretty good bargain at just over $250. Only one other task to sort out. The year before, we had almost lost my Poppa George after an old injury was aggravated causing severe internal bleeding, only to be complicated by medications he was taking. I wanted to bring attention to the disease he and I both share, Hemophilia. I contacted the Hemophilia Federation, told them my plan, and that I had a goal of raising $5000 for them. Of course, they had no objection and the fundraising began. Week after week, friends, family, and acquaintances generously donated to the cause. By the time I left the goal was met and we had raised over $5000 for the Hemophilia Federation. Again, thanks to everyone who supported this goal! All spring I had been riding as many 100+ mile rides as I could, even pushed it out to a 208-mile ride that took 22 hours. 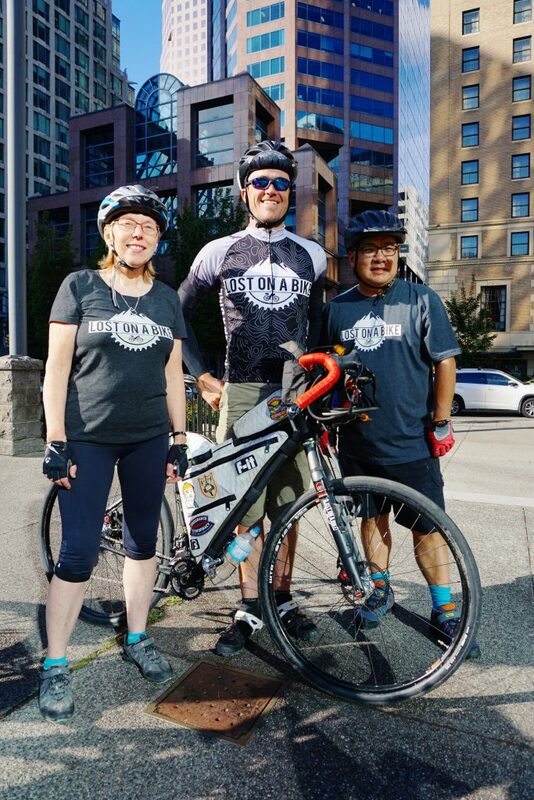 In the time allotted, I would have to ride 135 miles a day for 14 days straight. This was mind blowing as I had never ridden that many miles two days in a row, but after all my preparation I was confident enough I could pedal my way to the finish. With a couple weeks to go, I set out to ride a 300-mile loop from home, pushing myself as far as I could every day. The terrain is so rough, I had to fight it until after midnight every night, and wake up after 4 hours of sleep only to do it all over again the next day, only to push through in about 72 hours. On the final day, as I was topping out on Mingus Mountain, I teared up when I realized, I was completely ready for the task ahead. If I could push through terrain that difficult, some miles down the road would be no problem, right? 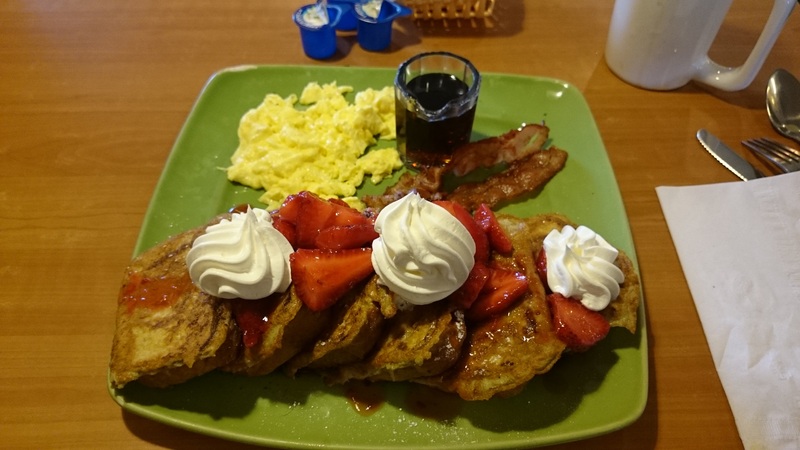 All great adventures start with a big breakfast. This one would have over a dozen. Before leaving for the airport, Sarah and I ate at the same spot my last trip to the Pacific Coast started from, Lone Spur Cafe. Even though I wouldn’t start riding for couple days, I was just as nervous as the last time I ate there. At this point, I knew anything that wasn’t packed, really wasn’t anything major, and should the need arise, it could be picked up on the route. After finishing our meal we were on our way to the airport. A little over an hour and we were saying our last good bye for several weeks. Security was quick and before I knew it, I was on my flight to Calgary. Once we landed, I had a short time to make it through customs before catching my connecting flight to Vancouver. I think I misunderstood my instructions, as all of a sudden I found myself outside of Airport Security. Though I was now headed for the end of a very long line, I made it better by swinging into Chic-Fil-A to grab a couple sandwiches. Everyone around me was jealous as they were also starved and crunched for time. I heard a security guard start asking people if they were on the WestJet flight to Vancouver and we were immediately escorted to the front of the line. I got the random rollerball explosives test as I passed through, glad I wasn’t handling any firearms that morning. The next flight was delayed by quite a bit which eased my pace as I was rushing to my gate. The flight to Vancouver was very short. On the way, I peered out the window as we flew over Banff, what should be the start of my second trip from Canada to Mexico. 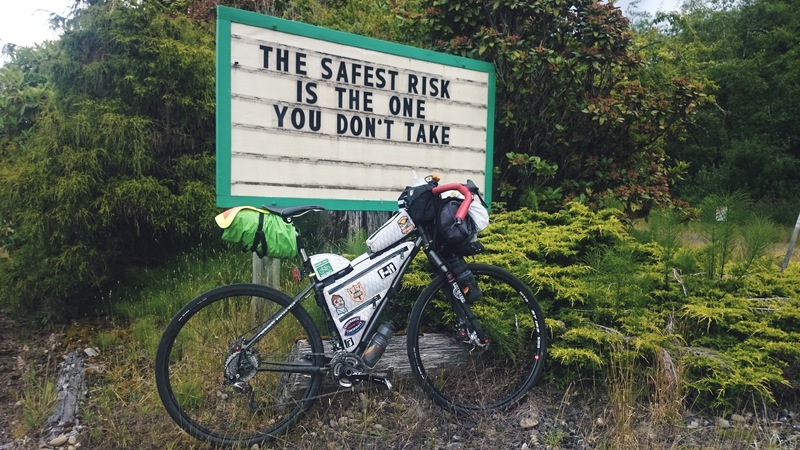 The Tour Divide was starting the next day. I imagined being at the start of this year’s race, mingling with the other racers, and dealing with the anxiety that would come with preparing to race a 2700 mile course. Next thing I knew, the plane was landing. 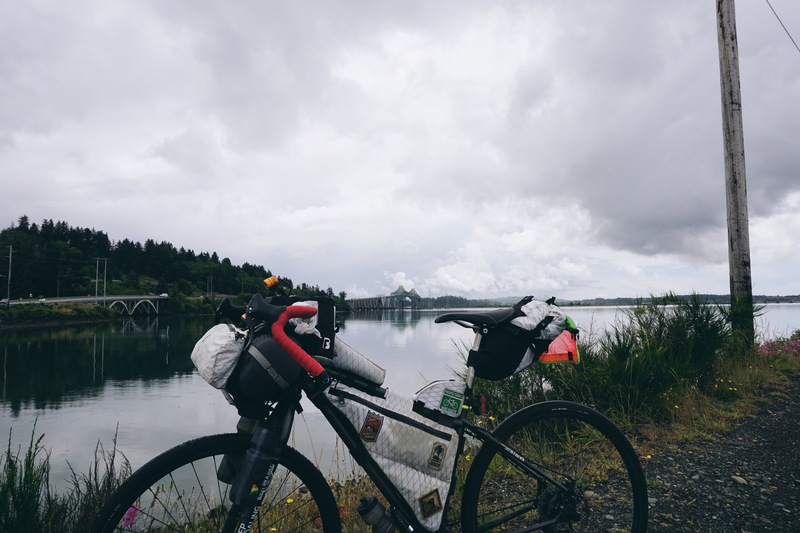 I had managed to carry all of my bikepacking gear in a small carry-on and my just-in-case backpack. As I was walking past all the people shuffling around the baggage carousel, I noticed a brightly colored sign that read “Lost on a Bike,” I had found Howard, my Warm Showers host. He asked where the rest of my stuff was, and I exclaimed, “This is it!” He was sure I had shipped tons of gear with my bike. Howard lives nearby the airport, so we jumped in a cab, and in no time we were at his apartment. Howard tried to make nachos while Wynn baked a meat pie and prepared some side vegetables. Both my hosts are seasoned bicycle tourists. A walk around their place made it very evident what they like to do in their spare time. The walls were covered in framed embroidered patches from trips all over the world. Bike racks in the living room and bookshelves loaded with touring books, repair guides, and stories from the road. It felt very much like home. We were talking so much, Howard forgot the nachos as they fried away in the oven. He pulled them out just before they were burnt. Still good, but Wynn’s dinner was great. We talked more over dinner, and strawberries and whipped cream dessert. With a full belly, I was asleep soon after I hit the pillow. The next day, Howard made eggs, bacon, and potatoes for breakfast. Much better than his nachos. We ate, then Howard got ready for work. We took the electric bus into downtown. About halfway, the buses compressor broke down, so the driver couldn’t release the brakes. Everyone got off, some got very upset, and we waited for the next bus. In no time, we were back on our way. We made it to Howard’s work, a musical instrument repair shop, which had plenty of room to build the bike I had shipped there earlier. I unpacked the bike and assembled it back into riding order. After double checking the bolts and pumping up the tires, I was off on a self-guided tour around the city. I wanted to get some Canadian money, so my first mission was to find an ATM. After an hour of rolling around, I finally found a bank with a bike rack outside. I got some cash and continued rolling aimlessly around town. 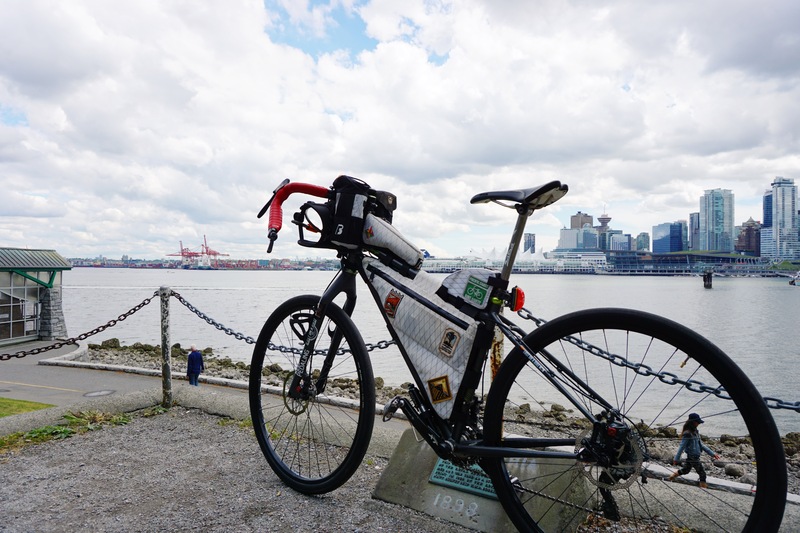 I followed some other cyclists until we reached one of Vancouver’s bicycle super highways. 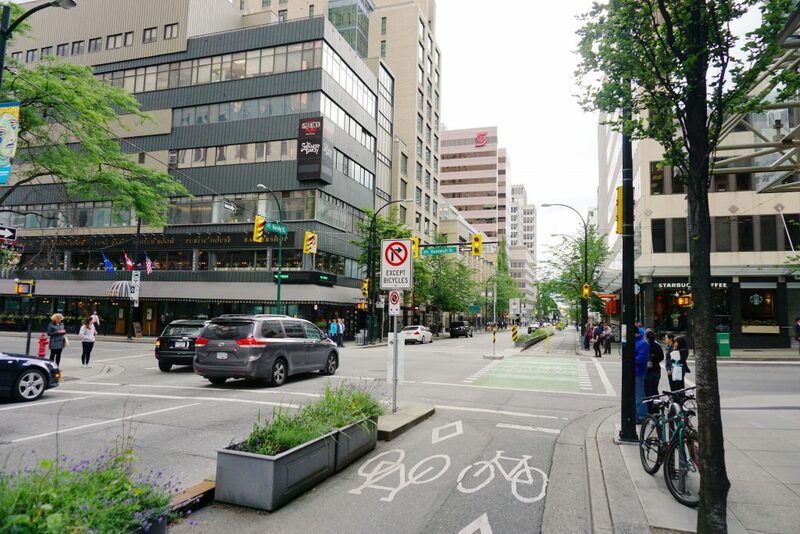 Two opposing bike lanes, separated from traffic by a planter barrier, with their own set of traffic signals. Come rush hour, these lanes were full of commuting cyclists racing home on a Friday night. 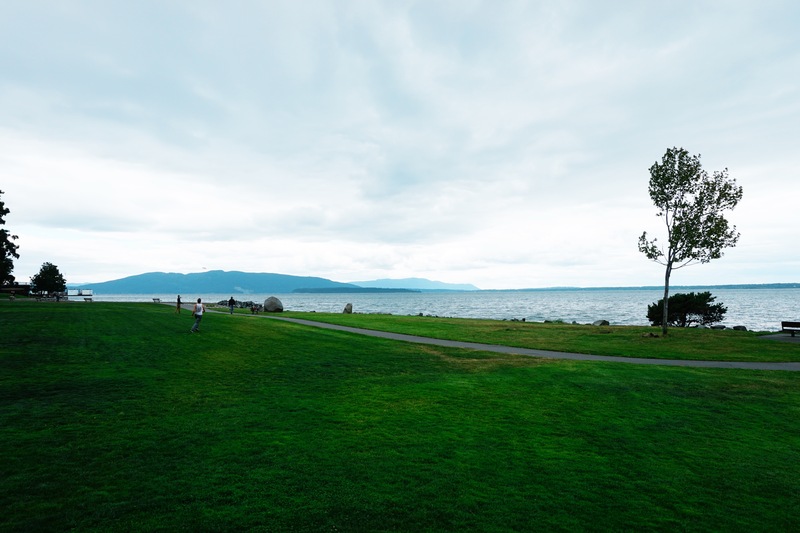 Stanley Park is a large park occupying the peninsula to the north of town. 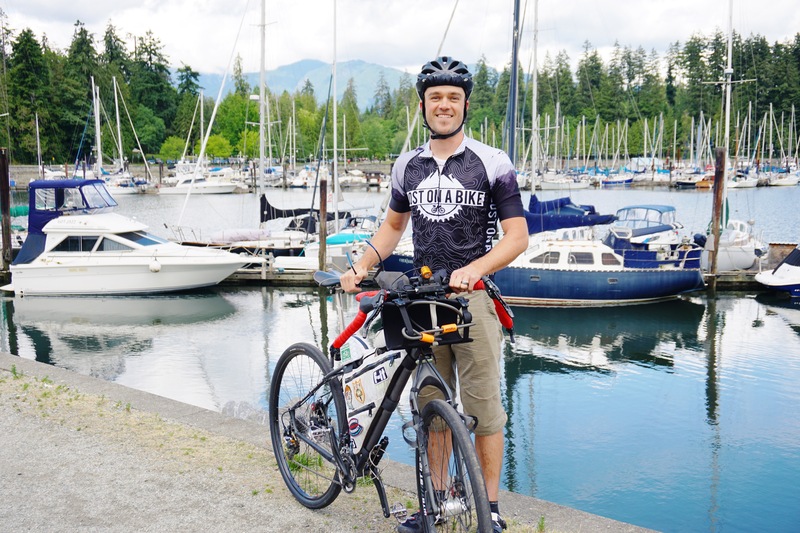 The bike path takes you along the harbor, several beaches, and the seawall. I had no idea where I was going, I just wandered around the park, eventually finding what looked like some single track but ended up being a super steep hike a bike down to the lower bike path. Here you can see the shipping yards across Vancouver Harbour. 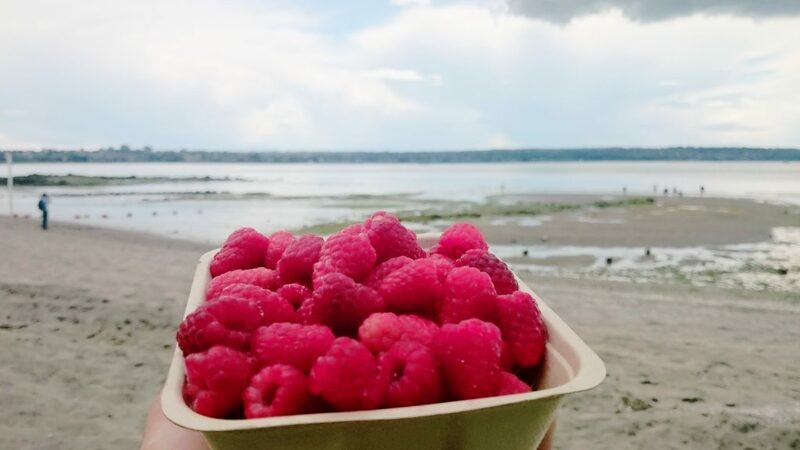 I was pretty hungry when I stumbled upon this fresh fruit stand selling fresh berries. I ate all of them. After getting lost and aimlessly riding around the city for hours, I finally made it back to the shop where Howard works. we rode to the middle of down town where some of his friends were waiting around for us to begin a tour around the city. Wyn and Howard were sporting the shirts I brought them, perfect time for a picture of the three of us. We rode around the city, again taking full advantage of Vancouver’s amazing bike lane system. The group chatted and asked me a million questions about the route, my previous experiences, and why the heck was I trying to finish in two weeks. They were amazed that I was trying to ride over 200 kilometers a day. Most of the group were full pannier toting touring cyclists who averaged about half of that distance each day on long rides. Many in the group had been on travels with Howard in the past. Some had been to Arizona and toured to the Grand Canyon through vicious side winds. On the way home from dinner, I bought the most expensive 6 pack of PBR ever and had a few to calm my nerves for a surprisingly decent night’s sleep. I was awake at 4:30 the next day, looked out the window, it was raining. What should I have expected? I was in the Pacific Northwest. Trying to be polite, I took a quick shower, savoring it, knowing it would be my last for a few days. I packed up all of my belongings and took a little extra time to make sure everything important was in a drybag. I was out the door by 6:15 am. My first goal of the morning was to find some snacks to eat on the way to the border and to spend most of the Canadian currency I had picked up the day before. The first gas station I came across had plenty of choices and I filled my feedbags with coffee cakes and Starbucks double shots. It drizzled all morning. The entire ride to the border had really good space for cyclists to ride. Having a nice shoulder to ride on can put your mind at ease, and on the bridges, there was a wall to protect cyclists and pedestrians from cars. Just short of the border, I heard an enormous hiss from my rear tire. I continued to pedal on, hoping the Stan’s sealant would plug up the hole. After many revolutions, it finally stopped leaking. 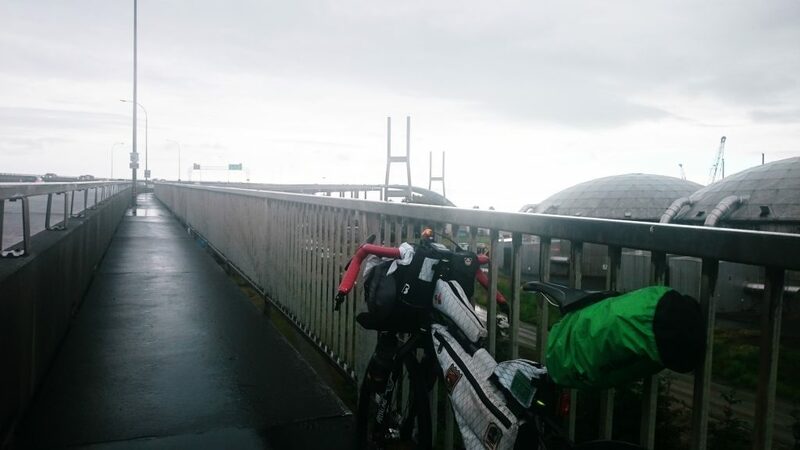 Shortly after, I found a bridge to hide from the rain where I stopped to pump it up a bit. I rotated the tire to find the hole when I saw it wasn’t just a normal puncture, whatever did the damaged cut sideways into the center of the smooth tread. There was now a tiny flap of rubber popping slightly upward right where the tire contacts the road. I was quite a way from the next bike shop, but thought why not just ride it until it gives me an issue? I can always throw a tube in if I need to. Off to the border. 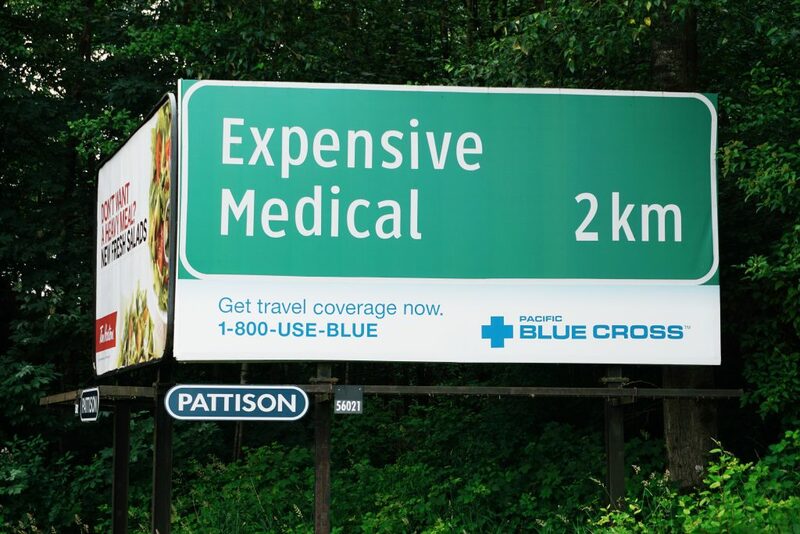 Oh, Canadians are so funny. By 10:30 I was in the United States. I had to go inside at Customs. 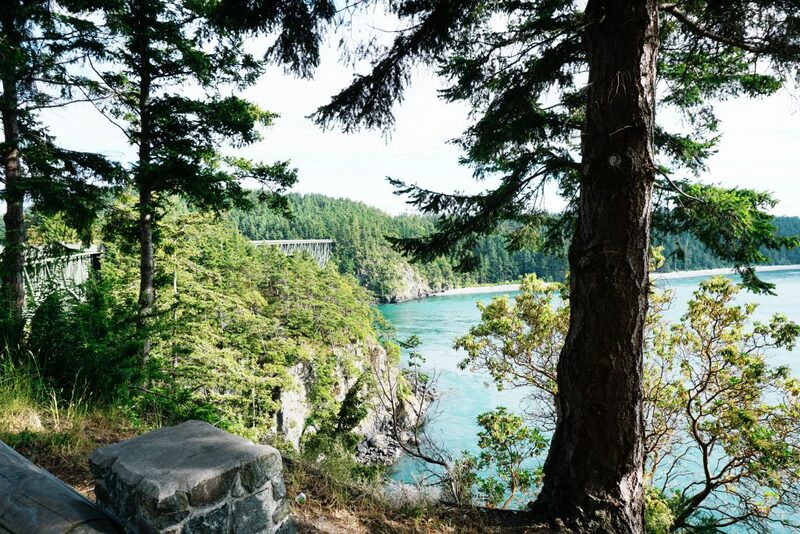 After showing the agent my passport, he questioned why I traveled to Canada, and I told him it was the start of my Pacific Coast tour. “You ever done something like this before?” he asked. “Kind of, just not this far,” I said. He gave me a head nod and a “good luck,” and I was out the door. I was hungry again and stopped at the Little Red Caboose to grab some food. I ordered a breakfast sandwich, not realizing it would take half an hour for it to be ready. After a bit of waiting, I thought it might be a perfect time to resupply and I told the lady at the counter I’d be back for my food in a minute. 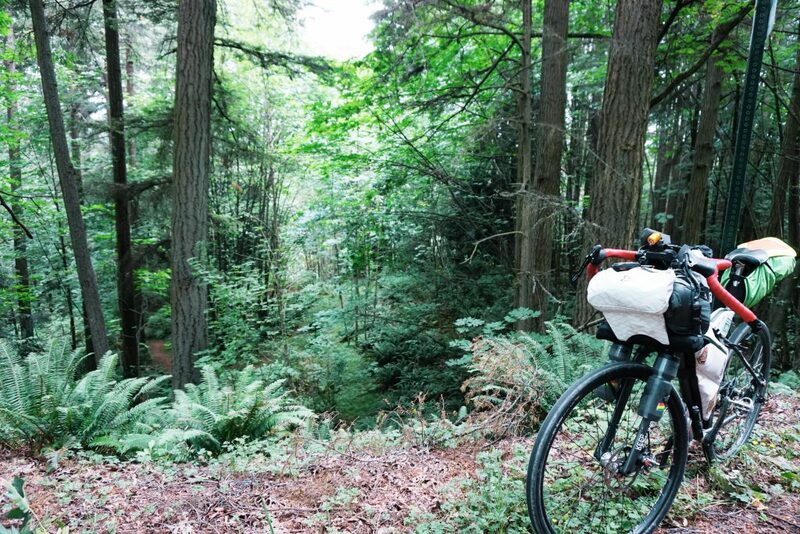 After grabbing some more snacks, I returned to the caboose, scarfed down my sandwich, and was off to Bellingham. When I arrived, it was time for some late lunch. 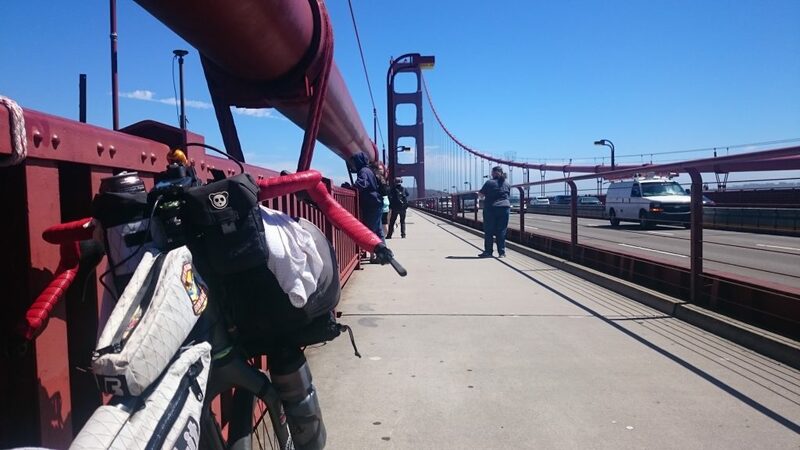 When bikepacking, I don’t carry a lock, anywhere I want to eat or refill, the bike has to be in view. After checking out a bunch of spots, I found a Jimmy John’s that would meet the criteria, and I could eat my two sandwiches as I was riding. It was after 2:00 and I wasn’t even halfway to my desired stop for the night. I had some nice bike paths to ride while eating, no worries about cars here. In no time I was surrounded by the lush greenery of the PNW. The sky cleared a bit in the afternoon, which only led to headwinds anytime I was exposed. The Deception Pass bridge took me to Whidbey Island at around 6:00. Still 25 miles away from the ferry to Port Townsend. 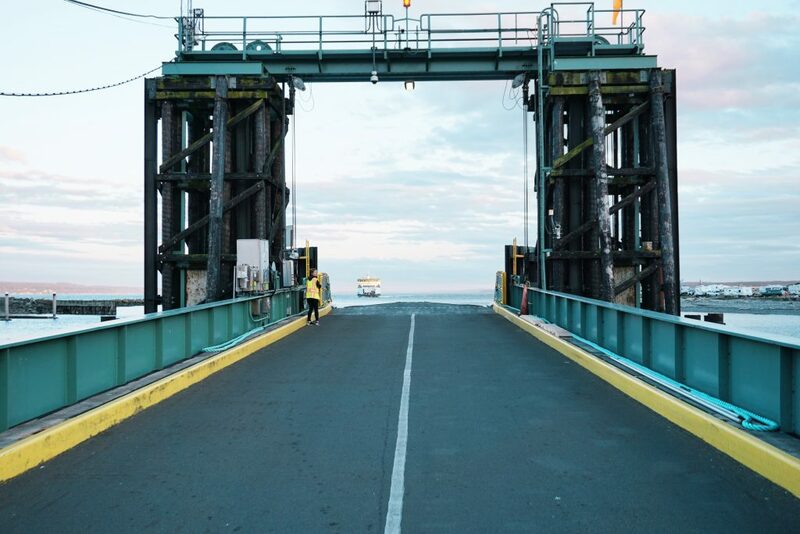 Two hours later, I made it to the ferry. Had I been there half an hour later, I would have camped on that side of the bay. As the pedestrians and cars were exiting the boat, I noticed a couple other touring cyclists. 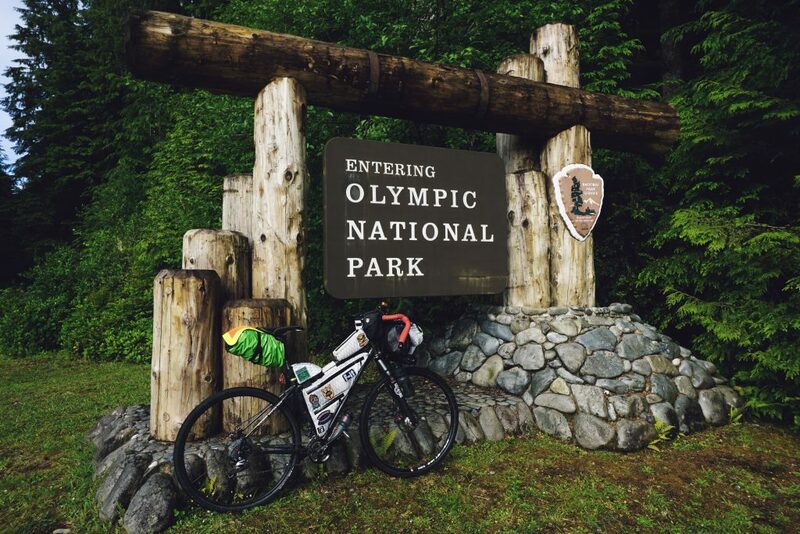 They had just wrapped up an overnight in Olympic National Park, my destination for the next day. I got to watch the sun set on the way across. The temps dropped and I put on my arm and leg warmers, as well as all my rain gear to protect from the wind. When we docked at Port Townsend, it was completely dark. I turned on my lights and tried to find some food somewhere. No luck, everything was closed. I climbed up to Fort Worden State Park, an old Army base where I hoped to make camp for the night. The entire park was packed. What looked like the barracks, were over run with what may have been graduation parties? I found a check in area, looking spent from riding 130 miles, and the lady at the desk could tell I had already figured out there was no place for me that night. She handed me a map and showed me where I could probably camp at the fairgrounds a couple miles down the road. By the time I set up my tent, it was 11:00. There was not one person out at the fairgrounds, and I didn’t see anywhere to get a permit. I was awake the next morning at 4:30. No rain that night meant I could pack up and get on the road. I still didn’t see anyone awake when I rolled out just before 6. 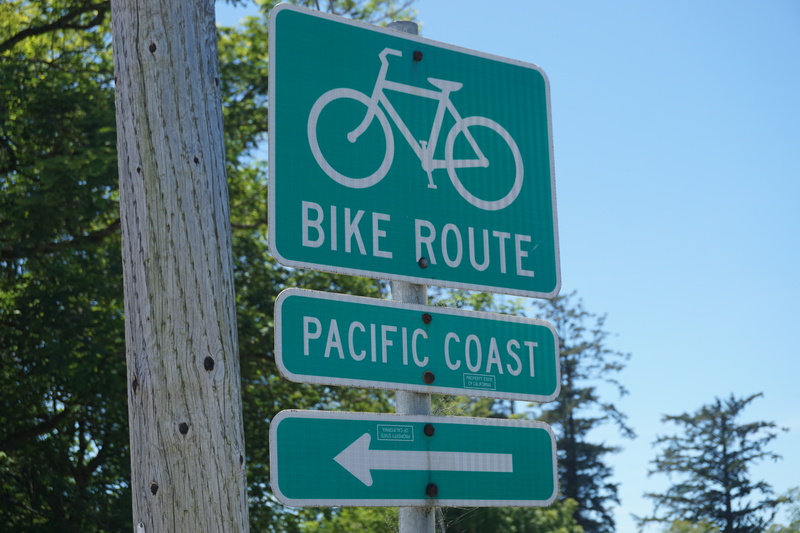 I rode back down into Port Townsend where I stopped to get some coffee cakes and Starbucks canned coffees. You can already see how my days tend to start. 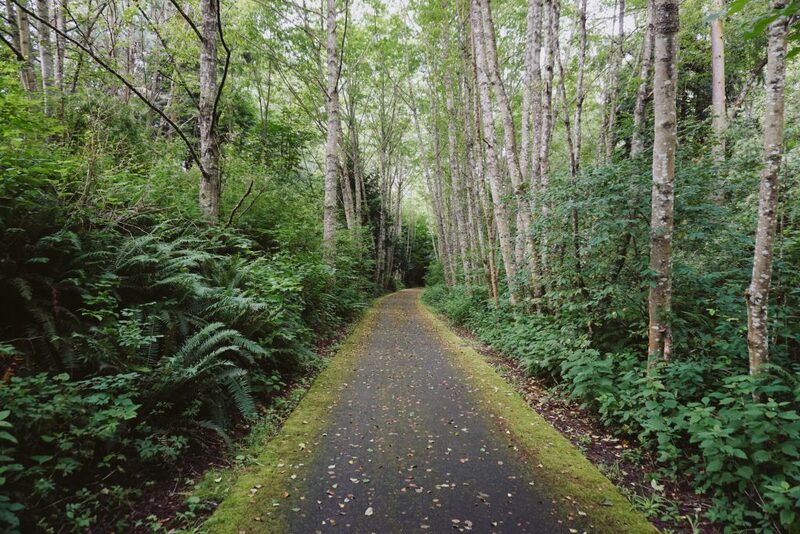 The next portion of the day would be spent on the Olympic Discovery Trail. A mix of roads and bike path that goes from Port Townsend to La Push. The road stays so moist, there is a healthy coat of moss growing on it. The miles ticked by and before I knew it I was in Port Angeles, beyond ready for lunch. Time for some carbs. The sun came out for the afternoon, lighting up the deep blues in Lake Crescent. As I was riding through the park, I would pass tourists, who would then pass me, back and forth. At one stop, some ladies commented on my jersey, and I handed them one of the cards with the information about my ride. At their next stop, they waved me down, all the ladies in the van scrounged up whatever cash they could and handed me a wad of $5’s, $1’s, and a $20. They said to spend it on food or whatever and wished me good luck and off they drove. It was over $40 and supplied a whole day’s food. After riding all the way through Forks I realized that would be my last refill spot for the day and the next 35 miles. I turned around and went back to the grocery store to load up for the night. 15 miles later, I was at Ho Ox Bow Rain Forest. 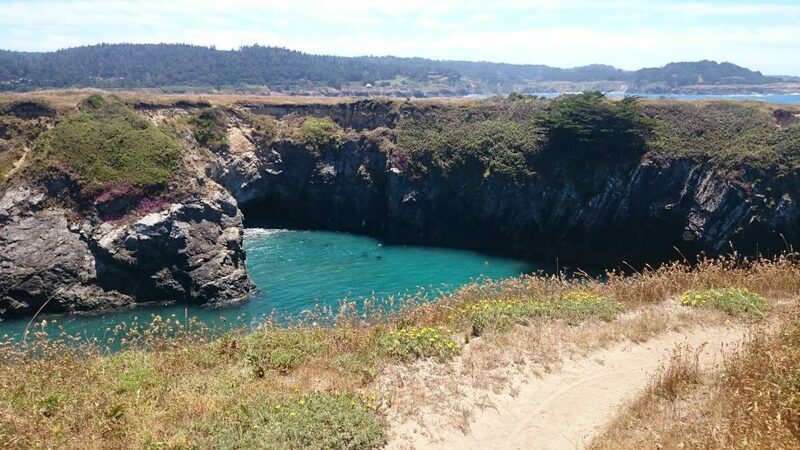 The beautiful blue water was only a few feet away from my campsite. Only moments after taking this picture, it started raining on me and for the rest of the night. 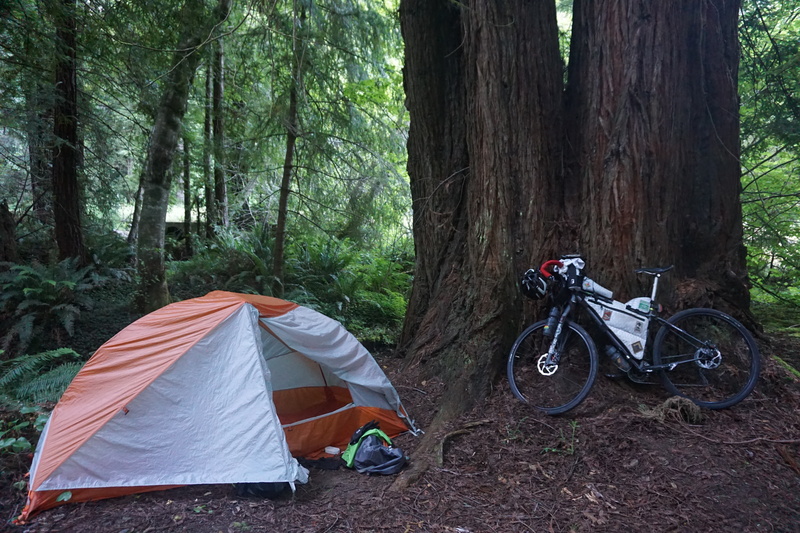 The rain in the morning slowed me down a bit and I ended up packing my tent away wet. I ate my breakfast hoping it would stop raining, but I had no such luck. The morning was rather chilly and damp. The light drizzle and downhill coasting had my hands freezing until I found a solution. On the side of the road, there was a huge plastic alfalfa feed bag that had maybe flown off a trailer. I used my knife to cut it into a sort of handlebar fairing, acting as a windshield for my hands. I was back in the National Park. 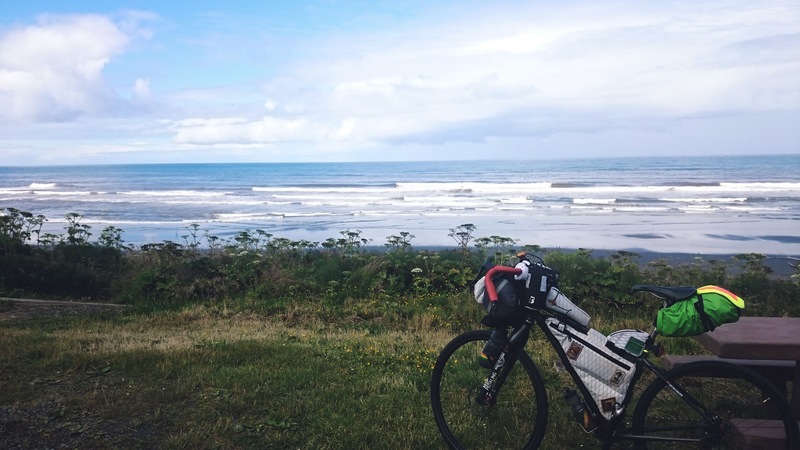 It was twenty miles from camp to Kalaloch Lodge where I had the first French Toast of the trip. Those twenty miles were very slow due to the cold, taking almost 4 hours to ride. After breakfast, it was rain, on and off all day. I’d put on my rain clothes, just to take them off again, all day, over and over. 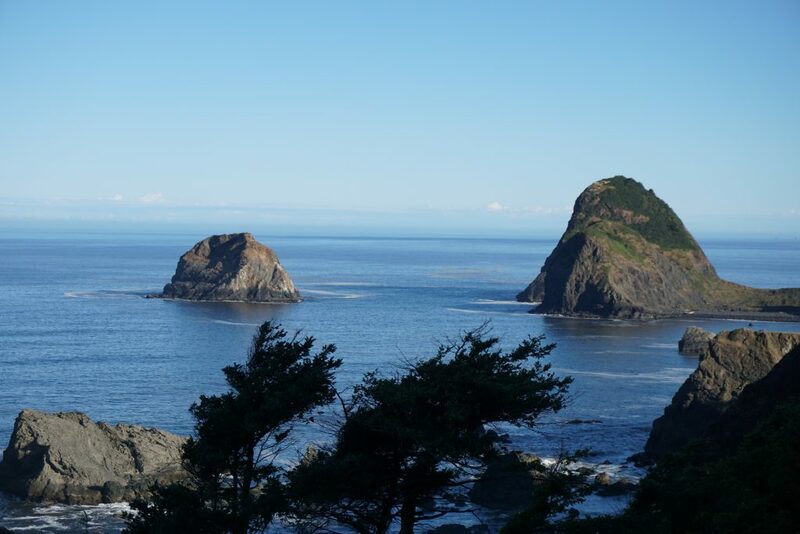 I caught one last glimpse of the ocean before heading into logging country. 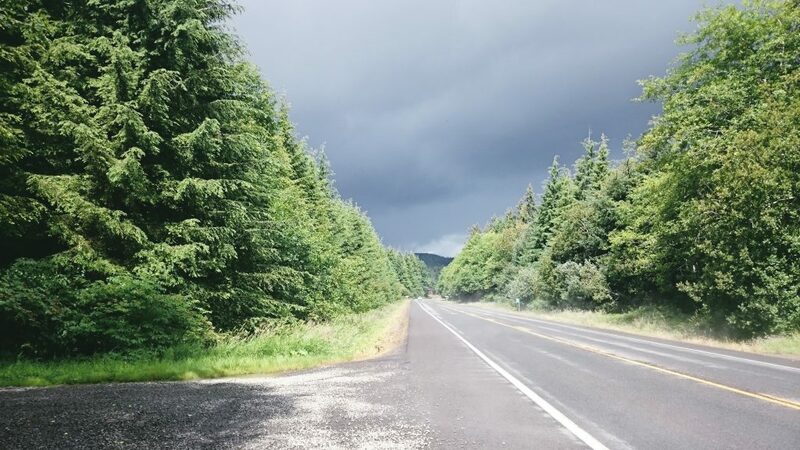 All day I passed by forests that had been replanted at least 3 times. I was lucky there was a nice shoulder, it was Monday, so the logging was in full effect with trucks whizzing by all day. There was one refill at a shop in the middle of nowhere. I stocked up again and ate some chips and a Snickers. The rivers all ran in amazing blues. With the slow start to the day, I didn’t make it to Aberdeen until after 5:00. 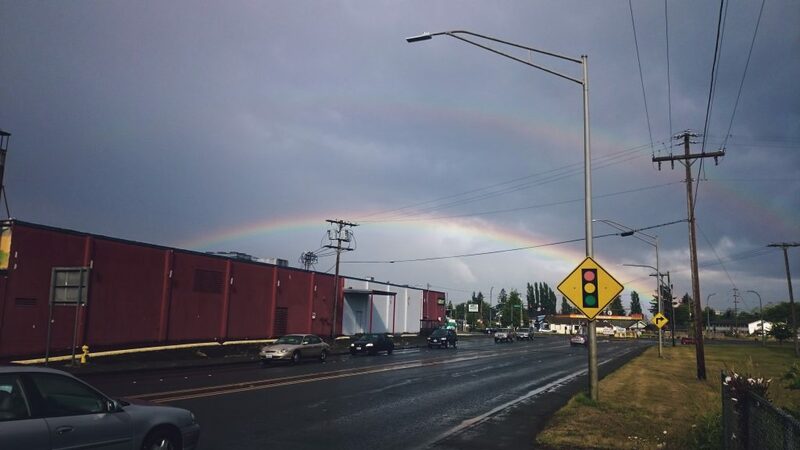 The rain let up for just long enough to make a double rainbow over the town. I checked the weather while I grabbed some more junk food at the gas station. This time, I asked for extra shopping bags so I could make wind/rain barriers for my hands. I found a Subway and picked up a sandwich to go, trying to take advantage of the break in the rain. While in the restaurant, taking advantage of the shelter, I called the campsite I wanted to make it to that night to make sure there was availability. She said they’d be expecting me, and they’d keep the gate open. I still had 30 miles to go and it would be nearing closing time before I’d arrive. 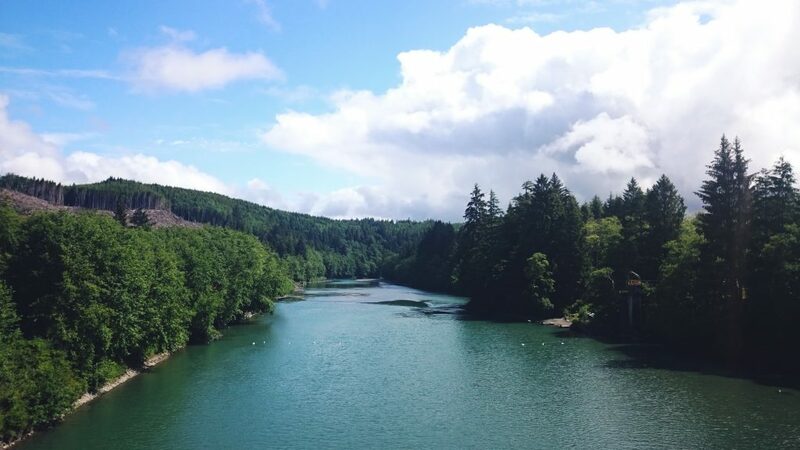 I headed out of town, following my route along the Chehalis River and Blue Slough. Cruising along, my GPS warned me that I was off route. I zoomed in, it looked close enough like the track just wasn’t set to the road. It happens sometimes. 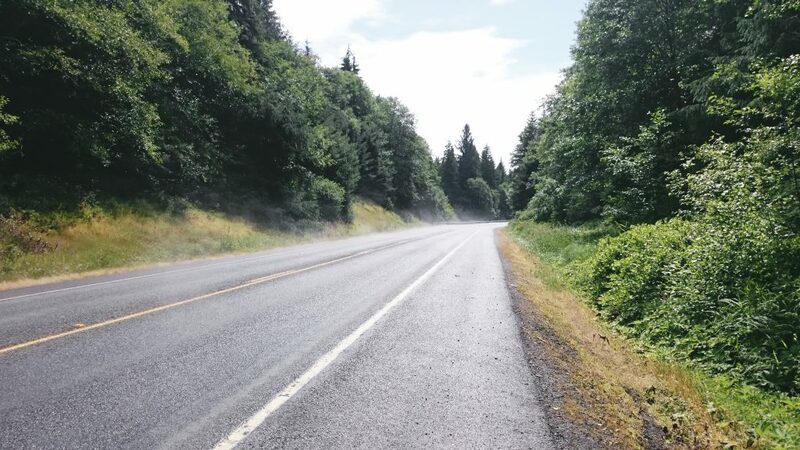 Besides, I couldn’t see anywhere else to ride, one side was the slough, the other was a really steep hill/cliff or logging area. The GPS switched back and forth from on track to off until the two ways made a larger split. I pulled out Google maps and tried to sort out the right way. 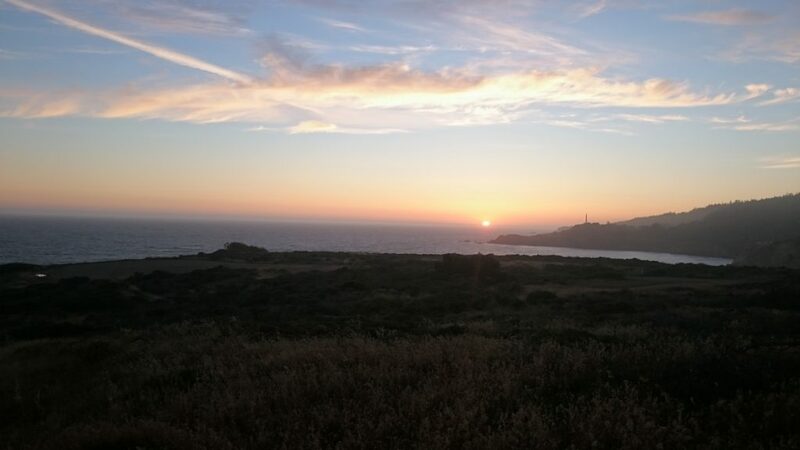 The shortest would be to turn around and get back on the 101. Less than a mile after turning around two black bears went running across the road from up high on the cliff side. I was outta there. I called Sarah to tell her what had just happened, only to scare her to death. A mile later I found where I had missed my turn. I was supposed to ride on an abandoned logging road, up to where the black bears had come from. I headed back to the 101 where I figured I’d be safer, but not before seeing this sign near the turn-off. Creepy. More rain, on and off. I was so hungry, but trying to get to camp, and I had already ridden 7 miles extra. I ate half my sandwich while riding, just to get some calories in me. I made it to Bruceport Campground just before the sky went dark. The husband and wife are caretakers for the park, living there in their camper. They greeted me, and I bought $5 worth of shower tokens as well as paying for my campsite. 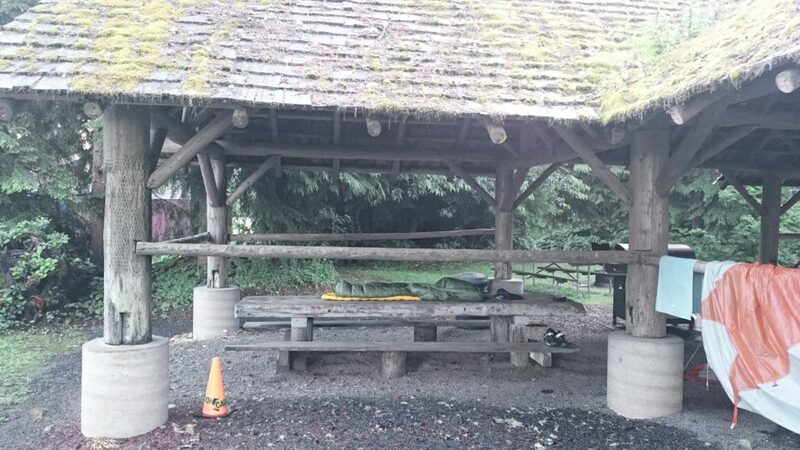 It was expensive, but since I was the only person there, they gave me the covered group camp area. This was a total blessing as I hadn’t had any chance to dry out my camping gear that day. I tried to hang my tent up to dry, but the air was so damp, that wasn’t helping at all. I ate my sandwich while pulling out my toiletries and getting ready to shower. Guess what? It started raining again. I hustled over to the showers. The building didn’t close up at all, and it was pretty cold inside. Only the water of the shower to keep me warm. The water shut off before I had finished rinsing off, so I shoved a bunch more coins in the meter, enough that the steam warmed me while I dried and got dressed. There was nowhere to have a real fire, and all the wood would have been soaked anyway. The group camp was a lucky spot though, they had a propane grill. To my excitement, it worked! I stood and worshiped the flames for warming me. It was getting late and I was warm enough, time to shut it down and get in the sleeping bag I had set up on the picnic table. As I laid there, I contemplated what I was going to do if it rained the whole next day. I heard some noise outside the shelter, when I looked, there was a raccoon family coming out the giant tree stump 20 feet away from my sleeping bag. I didn’t have any food laying out, and I was too tired to care about the rest. and on with the rain gear, the whole way to Astoria. After 25 miles, I picked up breakfast for the day, a giant tub of brownie bites, some orange juice, and some more Starbucks cans. 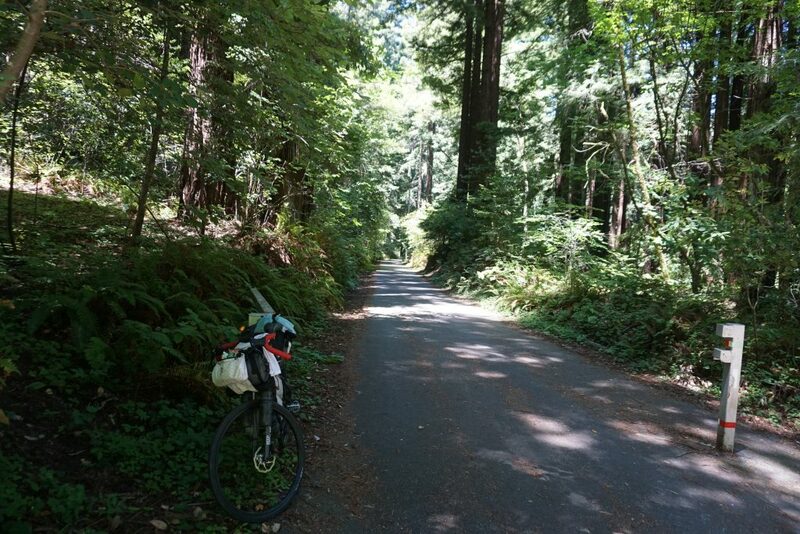 I was on the Lewis and Clark Trail Highway the rest of the way to Astoria. 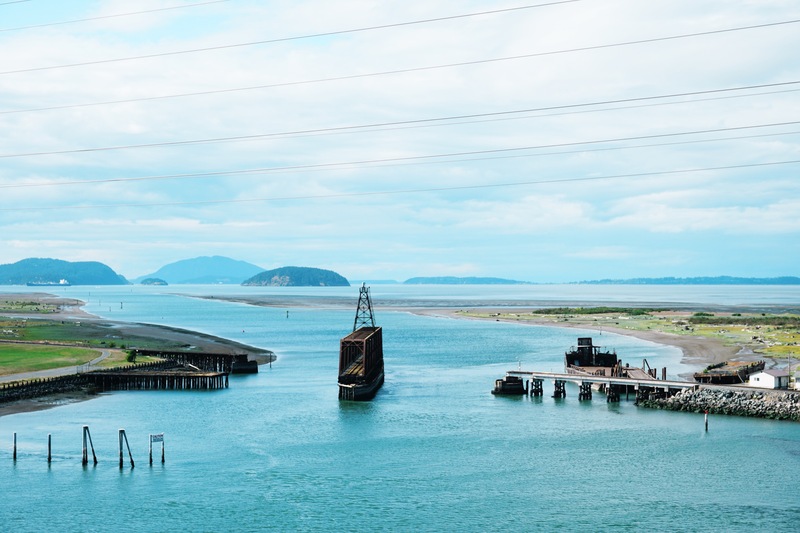 So small you can’t even see it is the Astoria-Megler bridge and Oregon on the other side. 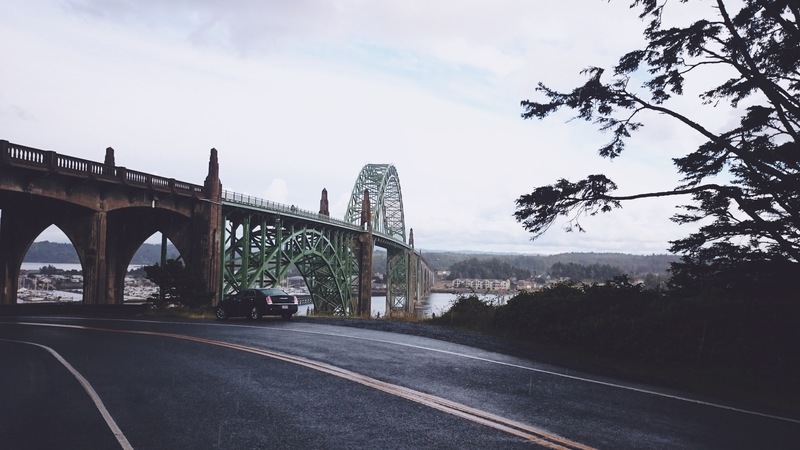 By the time I made it to the bridge, the rain clouds from the last picture were over the Columbia River. The entire bridge crossing I was getting blasted with rain and crazy wind. The first version of my rain legs didn’t cut it. My feet were soaked. I crossed another bridge, total gray-out wind blasting sideways, I had to ride with one eye closed, head tilted towards the blasting rain. No sooner than I was off the bridge, the sun started to come out. I could see a turn coming up on the GPS, but all I saw was a big grassy area. I got up close, and the path I was supposed to take was totally overgrown with tall grass. The Airport Dike Trail also looked halfway flooded from the constant rain. I could see several restaurants on the road to the right, so I found myself at a Dairy Queen, eating a giant value basket. Just as I was finishing my meal, the sky turned to gray. 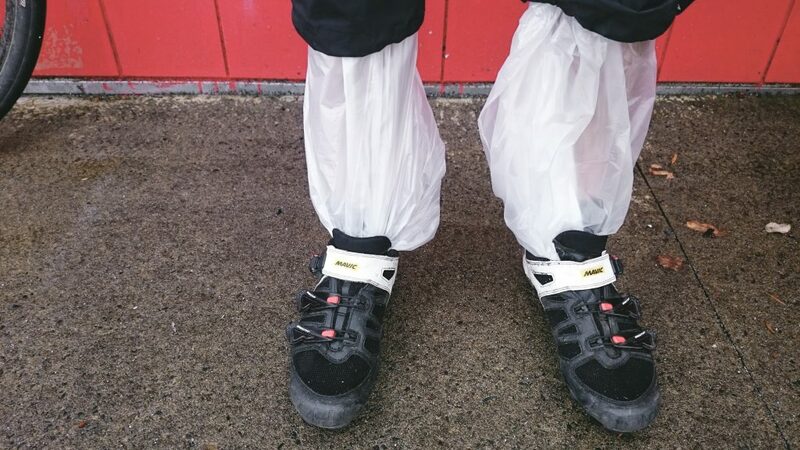 I had ditched my first set of garbage bag rain gators, since I had used one trash bag, split down the middle and wrapped around my calves, had leaked to the point I was sloshing around in my socks. I convinced the girl behind the counter to let me have two of their big garbage bags. 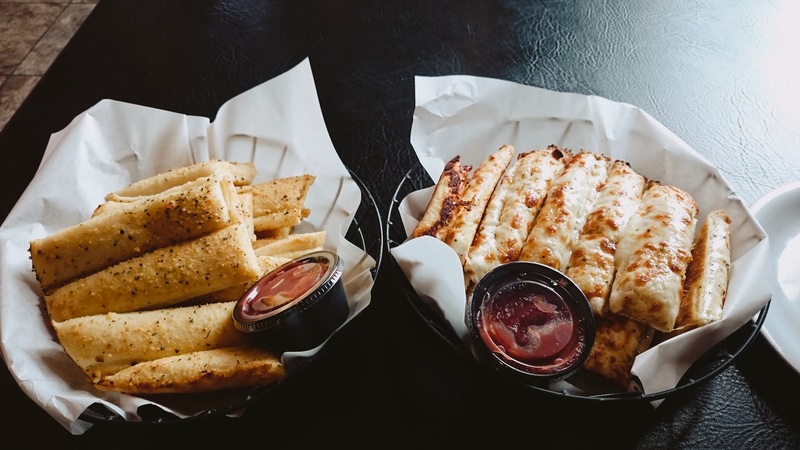 One for each leg. I planned out my reroute, and rolled on. The next portion of the day brought me inland, where it was a bit sunnier for the rest of the afternoon. The wind picked up, in the wrong direction, but I got to take off the rain gear! 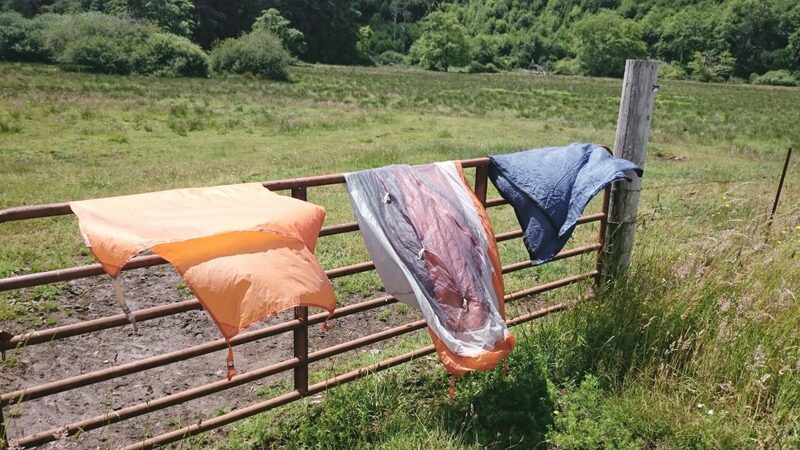 While I was stopped, I pulled out all my camping gear that had been wet for days and quickly dried it in the wind and sun. Almost as fast as I could pack away my rain gear, my tent had dried. Of all the restaurants on the whole coast, there was only one that I had really dreamed about refueling at, Mo’s. I remember visiting Mo’s Seafood Restaurant as a child when my family would vacation in Oregon. 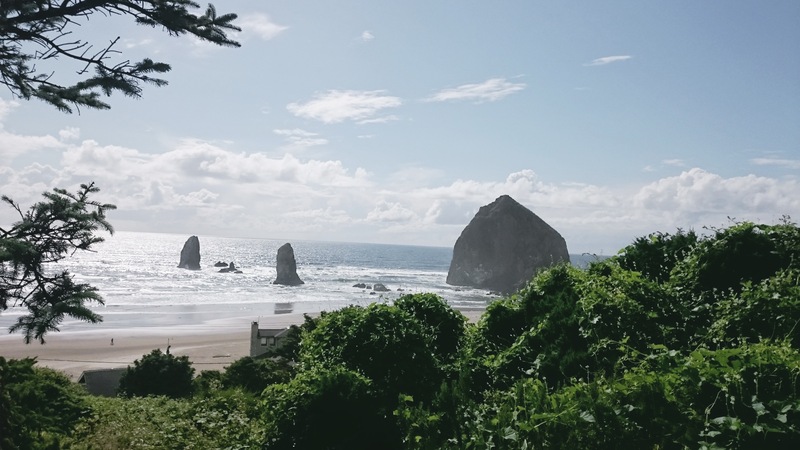 Minutes after passing the iconic Haystack Rock, I was at Mo’s Cannon Beach for a giant meal. By this point, the tightness I had felt in my shoes had made its way to the bottom of my calves. It wasn’t just the added material crammed into my shoes, it was my Achilles. Both of them were starting to scream at me. I tried easier gears to reduce the pressure, but every pedal stroke became more and more painful. The rest of the day, I’d pedal as softly as possible. The next camp was still a bit away but would be far short of my daily goal. I could almost hear my ankles creaking with every stretch. 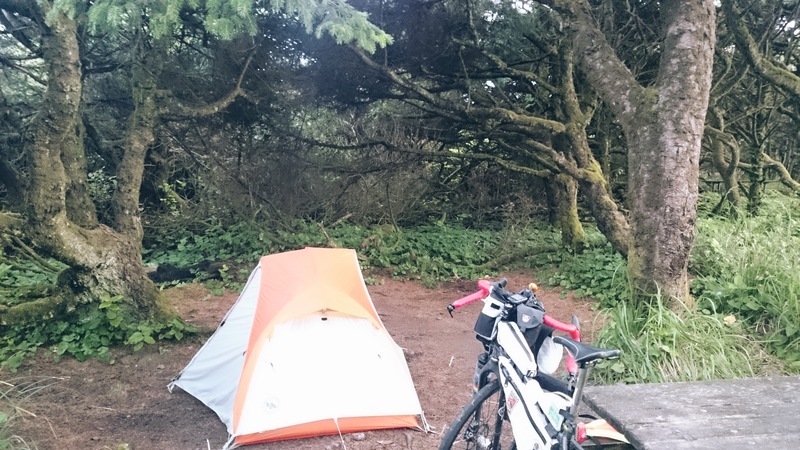 I arrived at the turn off for Nehalem Bay State Park, I pulled out my campsite list, the next camp was another 40 miles away. That’s where I wanted to be, but I really needed to evaluate the situation with my Achilles. After only 84 miles, I had to make the tough choice to call it quits for the day. 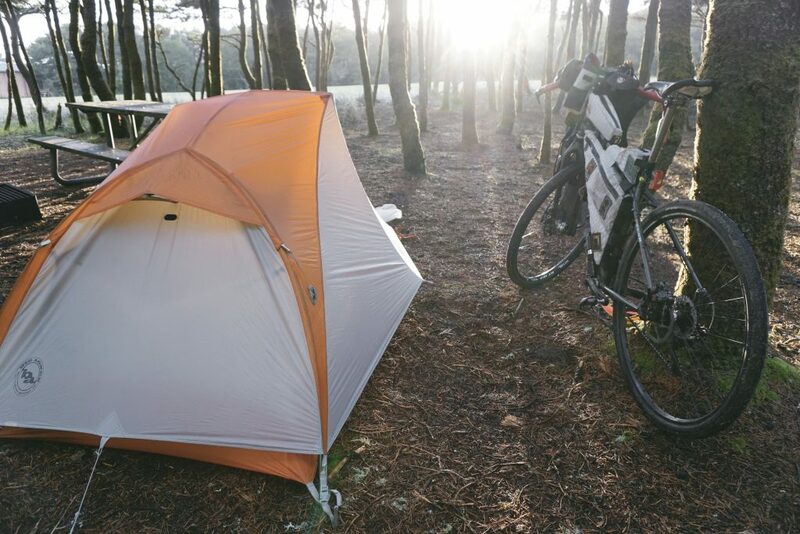 I lucked out and got the last Hiker/Biker campsite available. 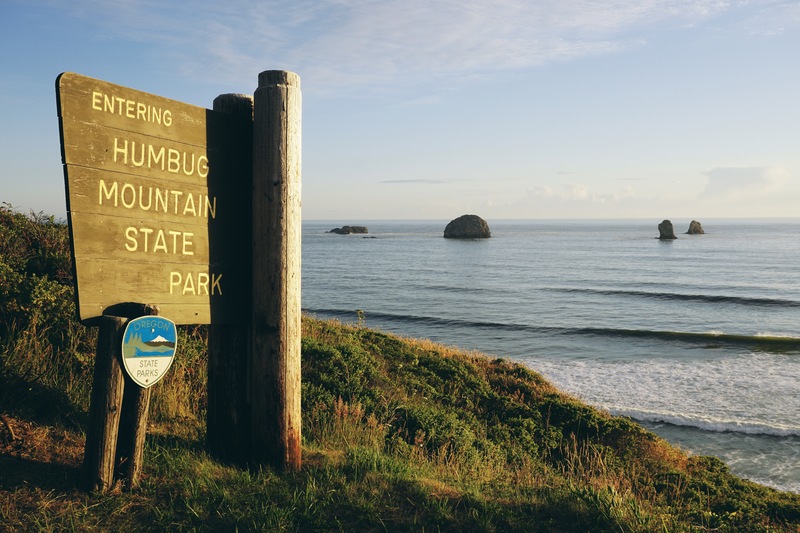 As I setup my tent, I looked across the campground to see a family of 4, two adults, and two kids, who were touring the Oregon coast. The kids had been riding in trailers, and they were packing more gear than I could believe. Full tarps were strewn between trees covered their picnic tables. The kids ran around playing after being cooped up in the trailer all day. No sooner than the tent was up, the rain came out for another 4 hours. I suppose I was a bit grateful that I wasn’t riding in it. After a long night of rest, I woke up only to have my ankles puffy and stiff, not wanting to cooperate at all. The camping gear was wet, but I had to get a move on, and the weather was supposed to be better that day, I could dry it out later. I rode slowly back to my route, each turn of the pedals was now excruciating. 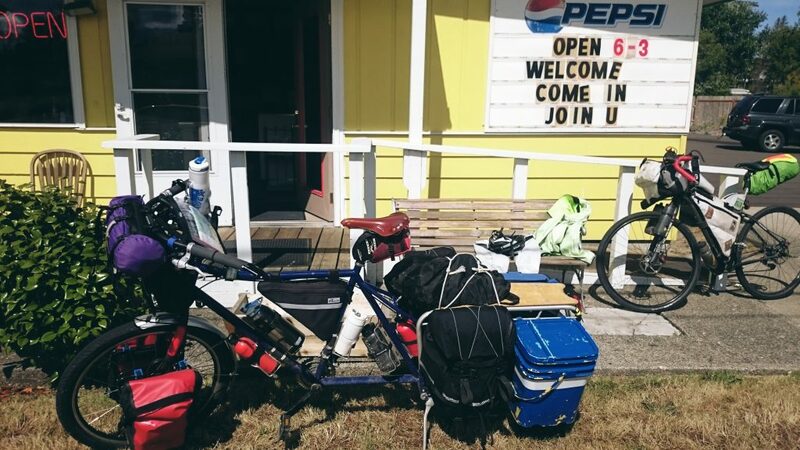 I found the first little cafe and spread my gear out on my bike so it could dry in the morning sun. I ordered the berry and ricotta filled French Toast. 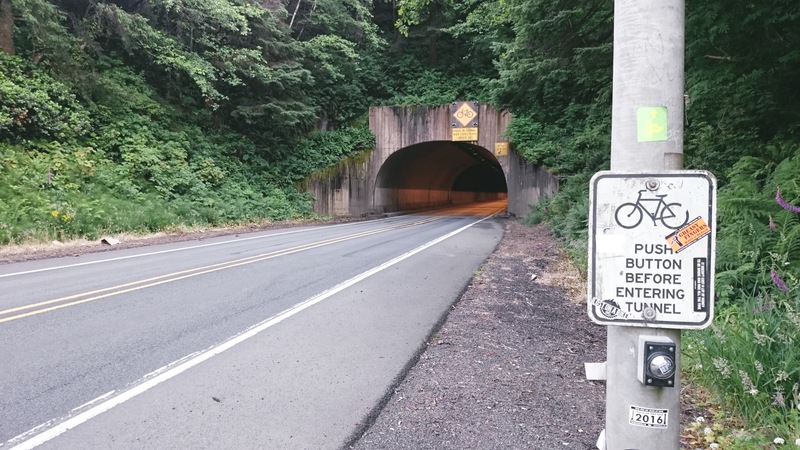 I was almost certain I was at the end of my ride and I had only made it one day into Oregon. I started looking up the closest public transportation that could get me home. It would mean busing to San Francisco and taking the train to LA, then another to Flagstaff. The downside, I’d have to ride to Portland to catch the bus. I massaged my ankles and while I was waiting for my food. There was no additional pain in any one spot, I didn’t think anything was torn, just highly irritated. I got super emotional, thinking about all the people back at home watching, the fact an article was already being written about my trip, and that I had committed so much energy to raising money for a great cause. I couldn’t possibly let all these people down without a fight. I scraped myself out of this dark place and started looking for a solution to the pain, instead of an escape route. I read about causes for the issue right when Dave Sewell sent me a text from AZ, wondering why I hadn’t moved as it was getting late in the morning. I told him my ankles were done, he questioned what my plan would be. I decided I was going to drop my seat, and try to pedal heels down, stretch, and see how it goes. This single moment, this one decision may have been one of the greatest turning points not only of the trip, but my life in general. This is the point where I really decided if there is any way to make this work, I am going to make it happen. If I could just take it easy enough to make it to San Francisco, I could at least make it to a train and finish the ride at another time. 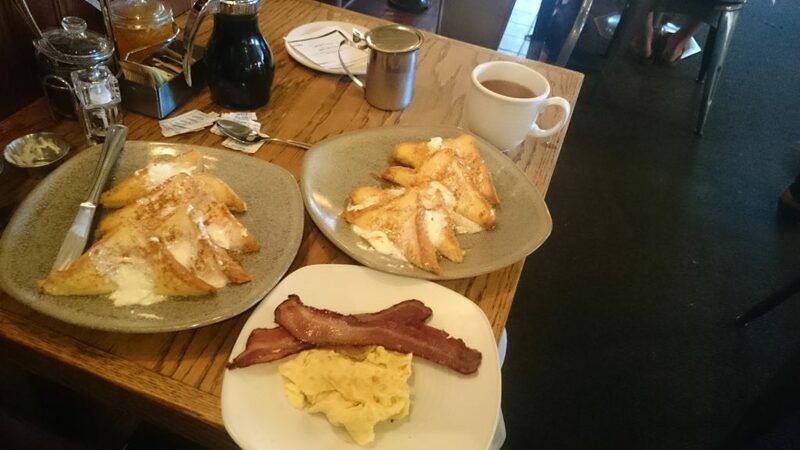 The french toast was so amazing, it put a smile on my face. I paid the bill, packed up my gear, dropped the seat, and carried on, heels down. This day would be the one where I would ride through all the places I used to visit as a child growing up. My dad’s side of the family lived in Oregon, and we visited the coast every so often. The fact that I got to reminisce about my childhood all day got me through the pain. 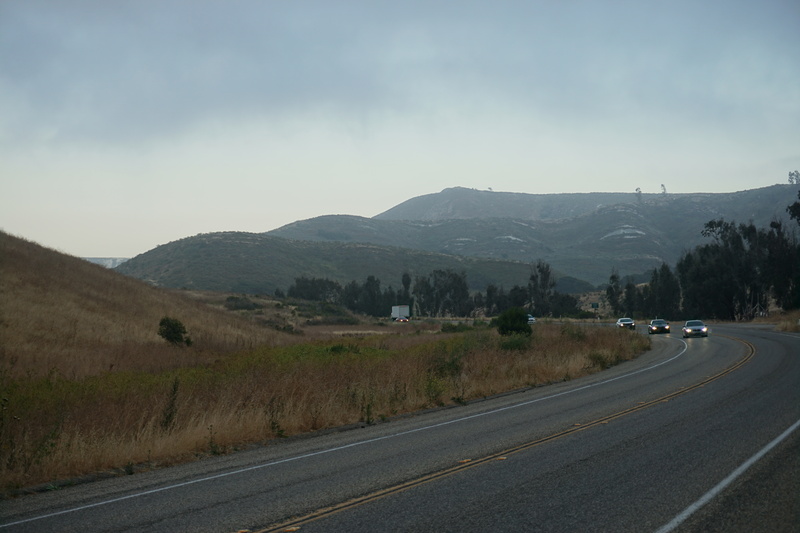 I had stopped at a gas station to refill where the cashier had joked about the big climb coming up, but the bike route wraps around it. I told her if the rest of my route was any indication, I would be doing the big climb. I was right. 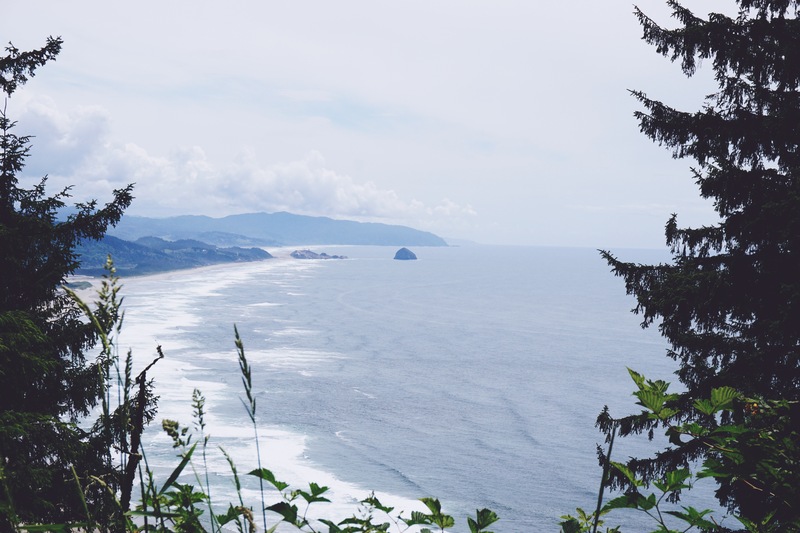 The climb up to Cape Lookout was nothing compared to the climbs in Arizona. The second big climb was in the lush green Siuslaw National Forest. Again in Oregon, moss grows on everything. Next up were the towns I recognized, first up Devil’s Lake where I played with my cousins on one trip. Ironically, when I got here, I had to take a detour through some neighborhoods where my parents would buy a house hardly a month later. 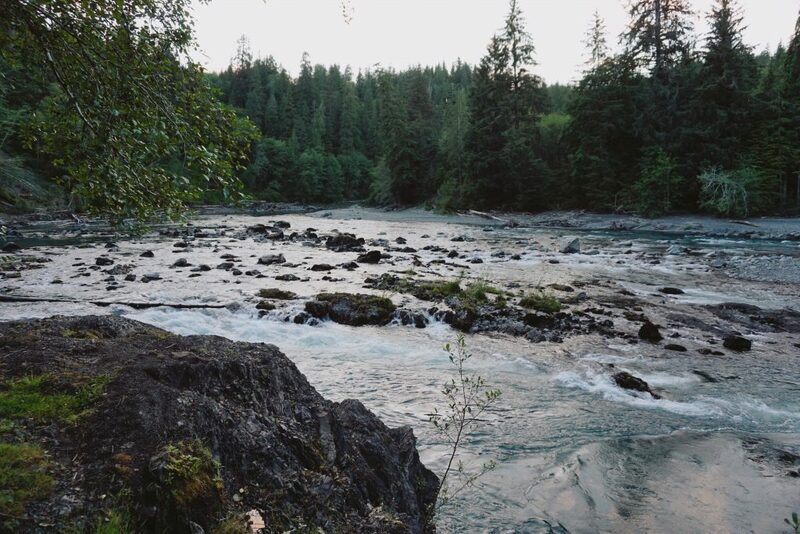 Back to the coast and the D River, the shortest river in the world, depending on the tide. 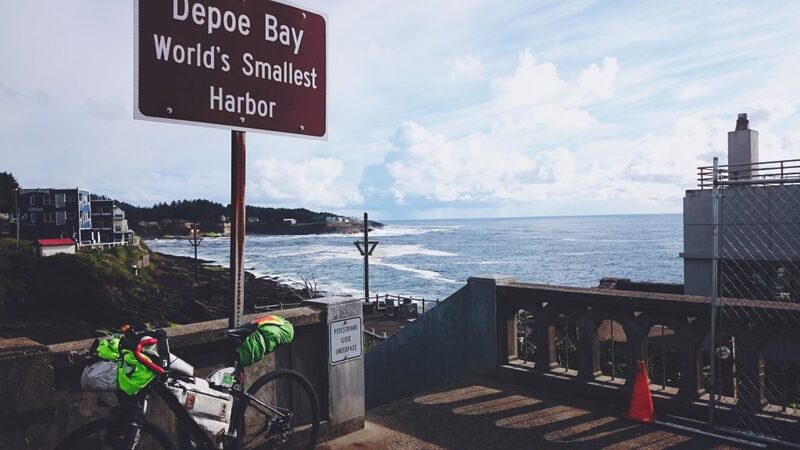 After Lincoln City, where my wife Sarah and I visited for our high school graduation gift, was the world’s smallest harbor, Depoe Bay. This was my favorite spot to buy salt water taffy and visit tourist shops, but not today. 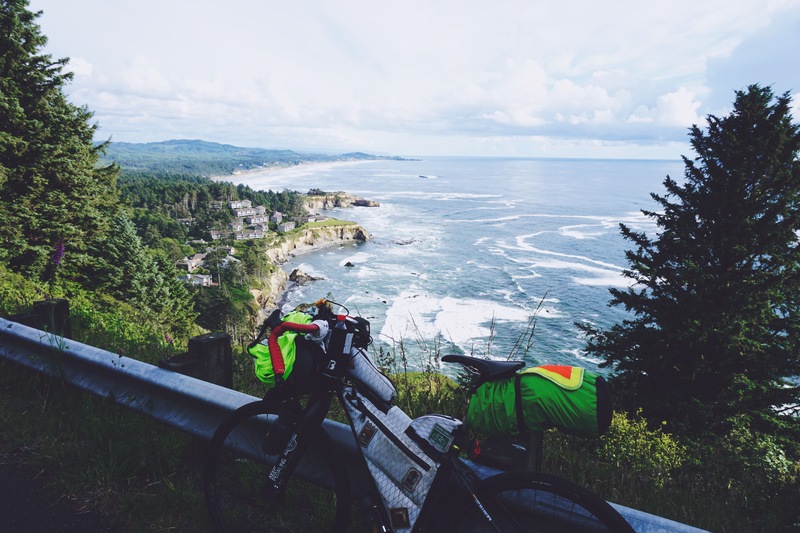 The Oregon Coast Bike Route was amazing. 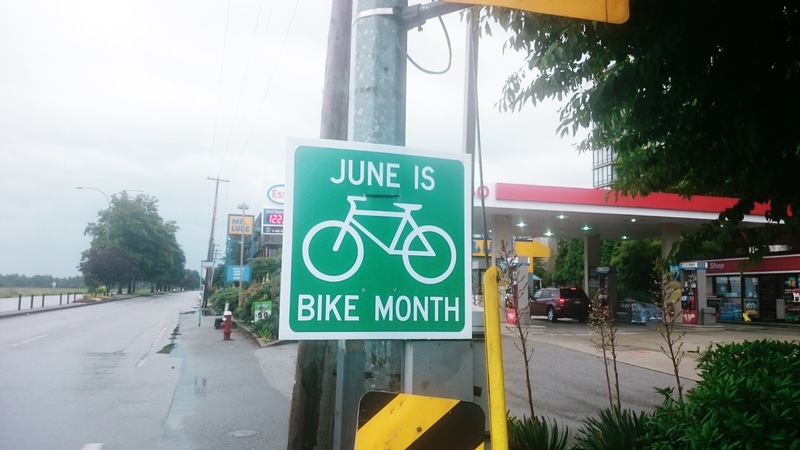 Special effort was made to get cyclists off the main highway and on beautiful side routes. The views kept me going all day, as well as it may have been the first day where I wasn’t constantly putting on and taking off the rain gear. I really couldn’t believe it when I made it to Newport that day. I had hit the century mark. Heels down and stretching was working. I considered stopping just after the bridge at South Beach State Park. Though, when I got there, it was only 20 more miles to Beachside Campground, and it wasn’t raining, so I carried on, stopping at a small store to grab coffee and some cakes for the next morning. I setup the tent just before the sun went down, rain fly on just in case, but no rain this time. I wandered over to the bathrooms and enjoyed my second shower of the trip. When I woke up, my ankles were still sore and swollen, but totally manageable. I hadn’t taken any pain medication at all, wanting to be able to fully monitor the status of the irritation. It was great to know the pain was not getting any worse. I packed up my dry gear and scoped out how far it would be to second breakfast while eating my first. There were some towns up ahead that appeared to have at least a coffee shop. On the bike at 6:40, the earliest in several days. The first town was a bust, nothing was open. I enjoyed the nice weather and stopped to take in the views of the lighthouses along the way. 30 miles later, I finally made it to a diner in Florence. More french toast this time. I scarfed down my food quickly, as I left, I saw another rider’s bike outside. He had a much larger load to carry. Except for my ankles, I felt fantastic, and even those weren’t holding me back. It was sunny all morning, for the first time, I got to leave the rain gear stowed away. I passed by the Oregon Dunes, and in the afternoon, The clouds rolled in the closer I got to the coast. Water refill in North Bend. 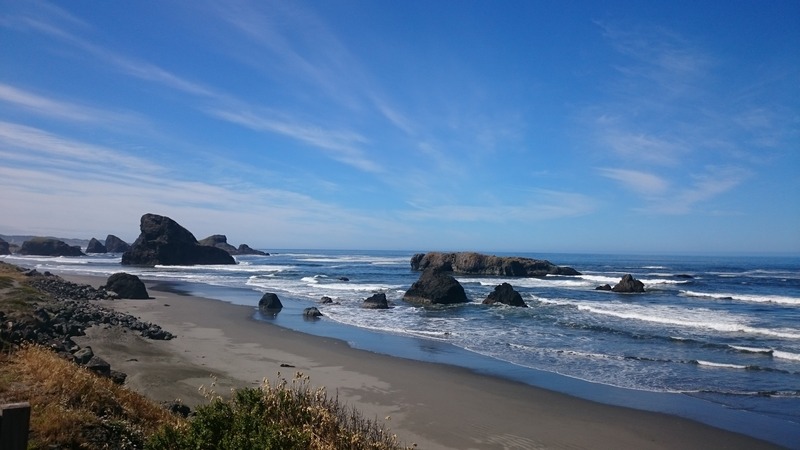 I stopped in Bandon and had a fantastic, fresh fish and chips dinner and refilled all my water bottles. 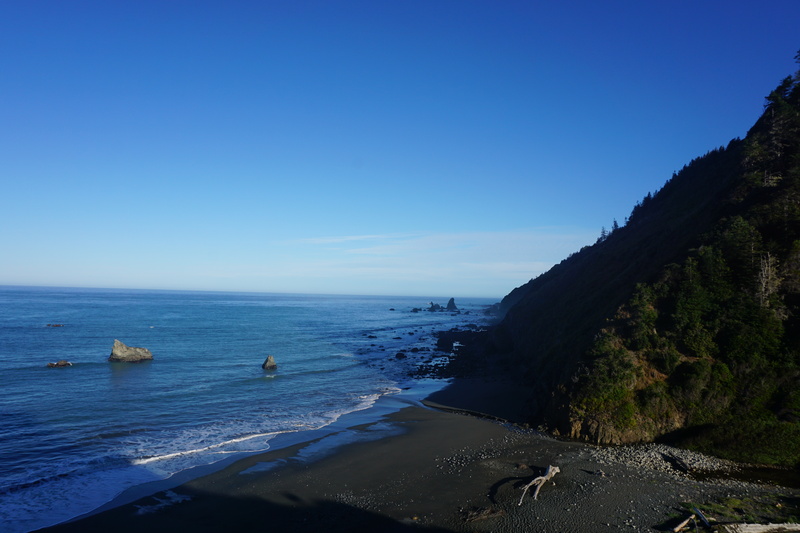 At Port Orford, I ran into a Circle K to pick up some food for the next morning. The sun was setting as I got to camp, no one was at the entrance to take my money. I climbed up to the Hike and Bike campsites and found a spot to set up the tent. After dealing with my ankle issues, I couldn’t believe I had traveled 142 miles before dark. I was the first one up at camp the next morning, excited by my progress from the day before and knowing I would cross into California this day, I was packed and on the road by 6:30. I had packed up before I remembered to take a photo. The morning was pretty chilly until the sun rose over the hills to the east. Breakfast wasn’t until mile 25, where I stopped at Double D’s in Gold Beach. A huge plate of french toast with strawberries hit the spot, even though the strawberries were still a bit frozen in the middle. I had big plans for the day. My ankles were on the mend, I was still stretching them often, but I didn’t have to be so conscious of every pedal stroke. 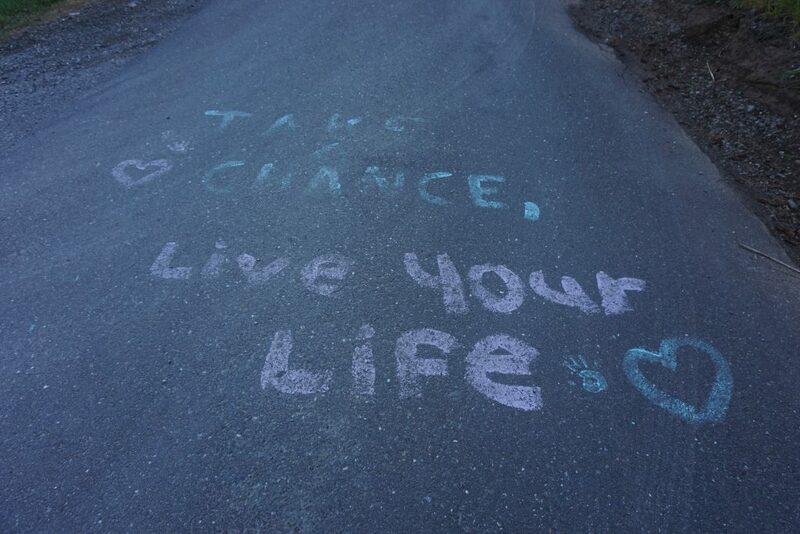 Contrary to the sign I saw in Washington, this message was a bit more encouraging. 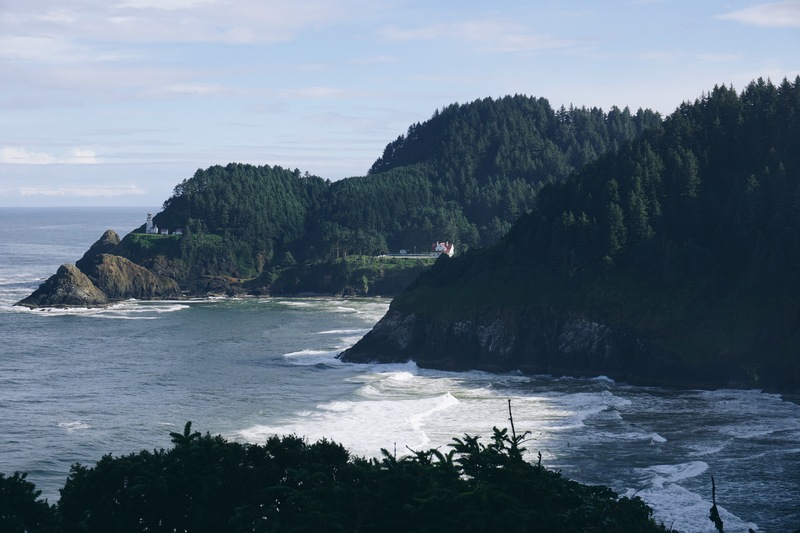 One last glimpse of the Oregon Coast. 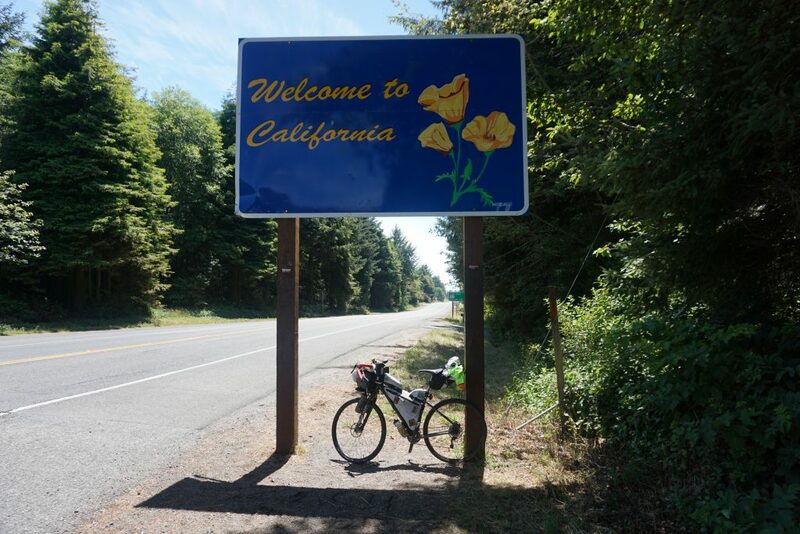 By 1:20, I had made it to the California state line. Not gonna lie, I cried my eyes out at this point. Only a few days earlier, I thought there was no way I’d make it to California. I couldn’t believe I was only half a day behind schedule. I wiped the tears of joy from my cheeks and carried on. 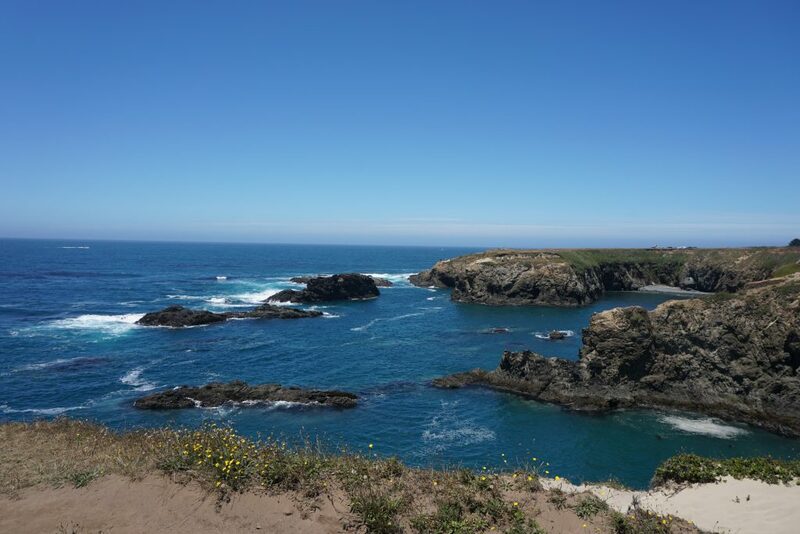 Northern California wasn’t too much different than Oregon in terms of population. I didn’t feel like I was in a different state and there was generally plenty of shoulder. It was a beautiful sunny day, definitely the sunniest and warmest so far. The lighthouses in Cali did seem a bit more extravagant. 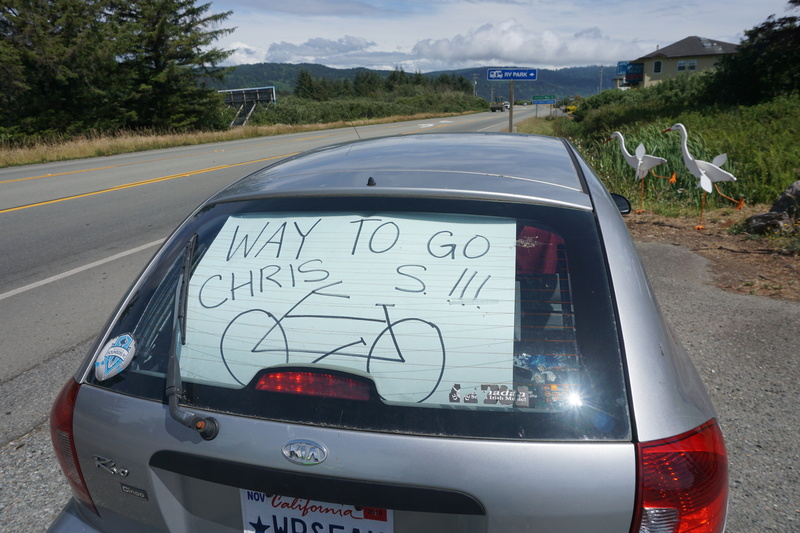 As I rolled up to Crescent City There was a car parked on the side of the road with a sign in the rear window. A woman named Bernadette had visited Prescott a month earlier and picked up one of my post cards. She had been watching my ride from the start and had taken a break from work just to come cheer me on. I thanked her for her support and she was back to work. In no time at all, I was climbing up to a better view of the coast line. The miles just kept ticking by. Breakfast was the only meal I had stopped to eat. 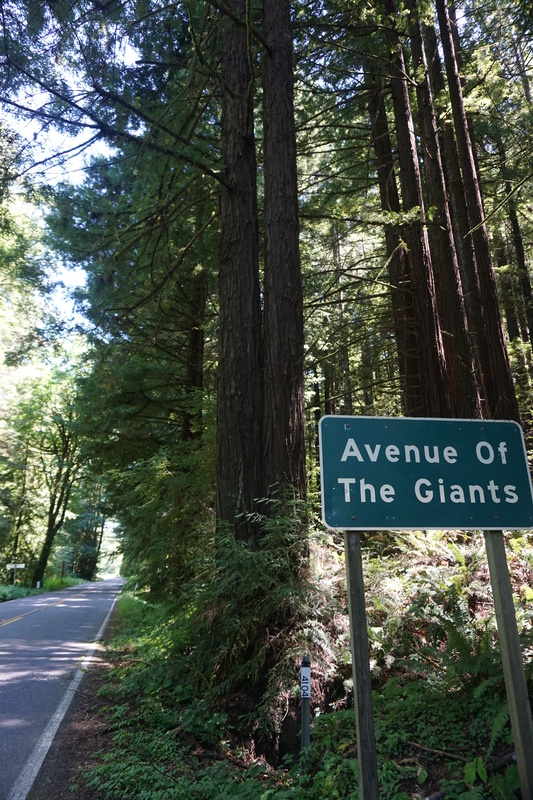 The Redwood forests of Northern California were everything I thought they would be. Every tree was bigger than the last. It was nice to be in the shade of the giant trees all around me. The downside to giant trees was the giant pollen. My eyes were driving me nuts, watering and itching like crazy. I stopped at a roadside attraction for some antihistamine and eye drops. Some nice people offered to take my photo with Paul Bunyan. 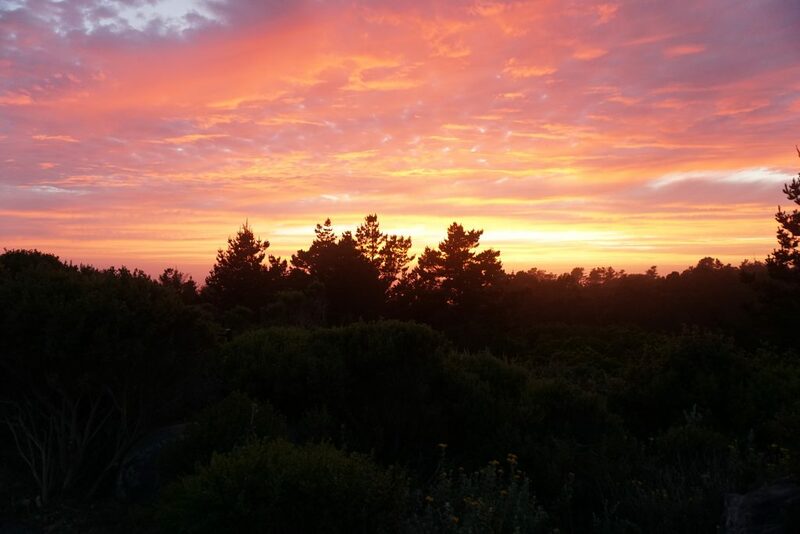 The route left the protection of the forest, and again I was at sea level for Sunset. I continued on in the dark, first looking for a refill spot, which I found in Trinidad at 9:45, just 15 minutes til close. I grabbed some food for the morning, and some Snickers bars to hold me over that night. Every roadside campground was packed. At 10:30 I made it to Clam Beach, also full, but after my biggest day yet, 150 miles, I was ready for rest. 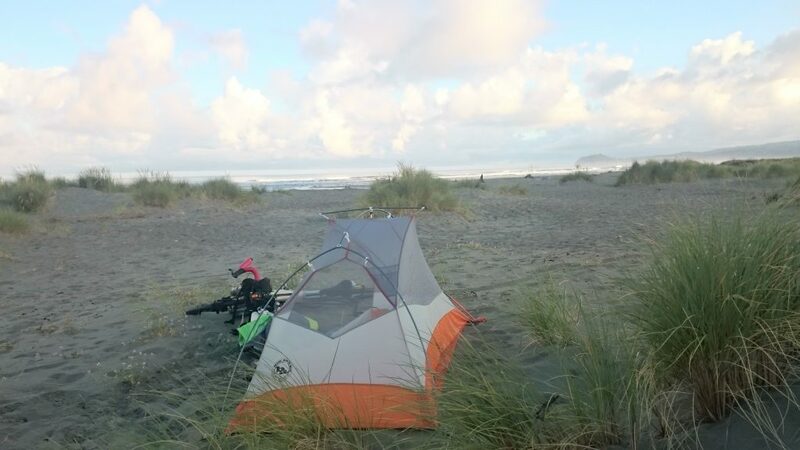 I pushed the bike through the sand until I found a quiet spot and set my tent up, right on the beach. I thought I was far enough away from camp, but a bunch of people from the campground headed over to the beach too and made plenty of noise to keep me up for another hour. Day 8 started a little later than I had hoped, but I was still moving before 7. It was only 18 miles to the Chalet House of Omelettes in Eureka, for, you guessed it, French Toast. I had to wait for a table, as I was there just in time for the Saturday morning rush. I went outside to lay all my camping gear out on the sidewalk to dry out. I went back in to eat. I finished my food, packed up my gear, slathered on the sunscreen, and rode off into the farms surrounding Fortuna. Looking at the maps, I wasn’t sure where I would find a good dinner, so I opted for a good lunch at DJ’s Burger Bar in Del Rio. 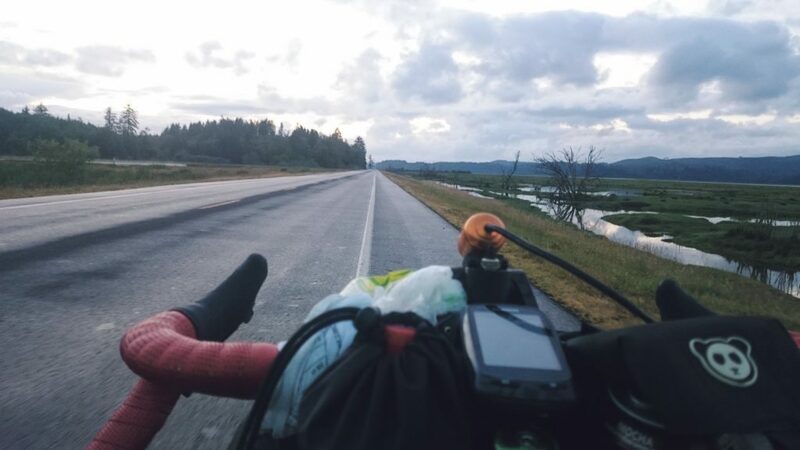 I talked to some motorcyclists who were also touring, they couldn’t believe I was averaging 130 miles a day. They said they weren’t even riding their motorcycles that far. Just after lunch, I was back in redwood country. I could have taken more pictures, but it would get boring just looking at pictures of the forest that could never do it justice. The trees are so massive they won’t even fit in the frame of the camera. 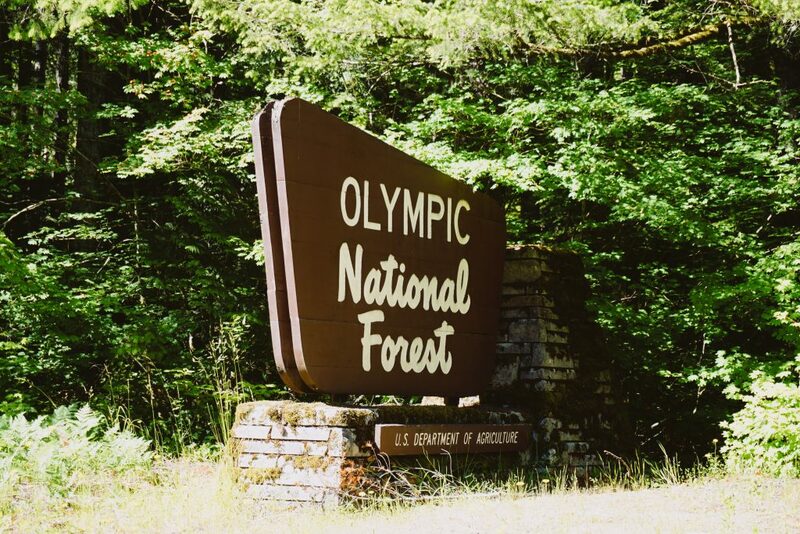 There were lots of really neat campgrounds strewn throughout the forest all of them packed with weekend campers. I passed by a giant hippie music festival that smelled of skunk from a mile away. To hit my goal for the day, I had one final hill to climb. 1000′ gain in 3.5 miles. Pretty normal for here in AZ, but it was day 8, and I rode 130 miles to get there. I was sweating my way to the top as the temperatures continued to drop. As I reached the summit, a van full of college kids were cheering me on. “We’re runners, we get it,” they shouted. I called Sarah to let her know I was almost done riding for the day, I just had to put all my clothes on, and bomb down the far side of the hill. 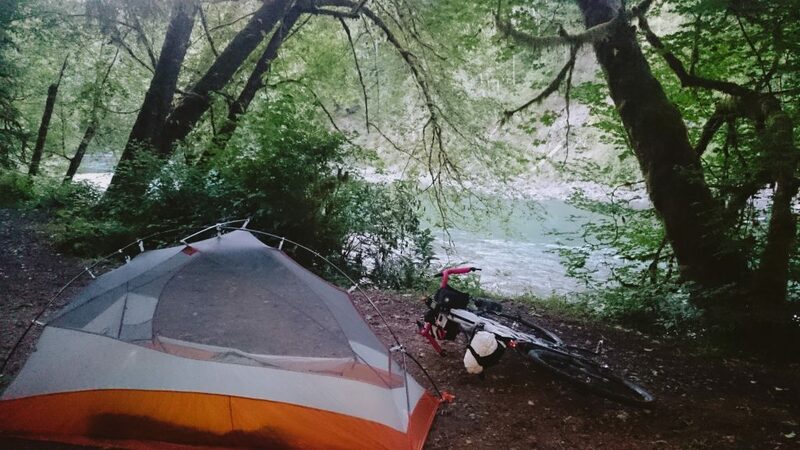 I still had nowhere to sleep, when I got to an empty logging company picnic area, I found a secluded spot next to a creek, set up the tent and dozed off. 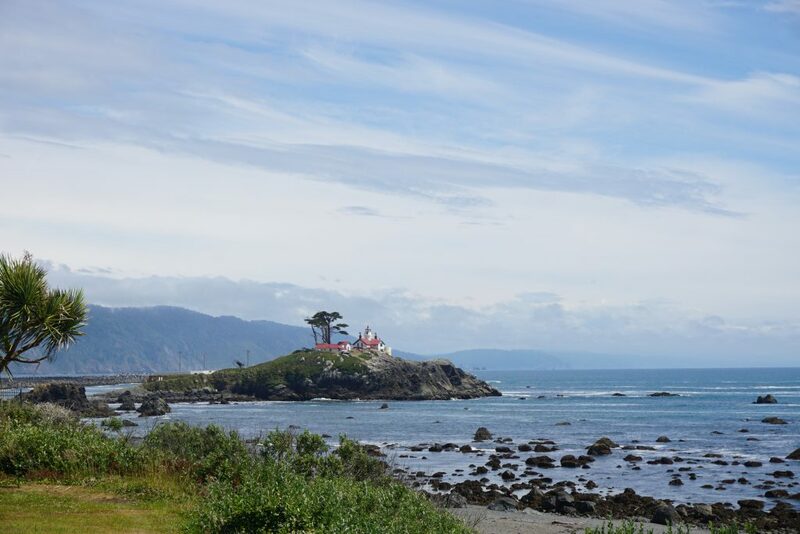 The morning started with one big climb and descent, and 30 miles of coastline until breakfast. 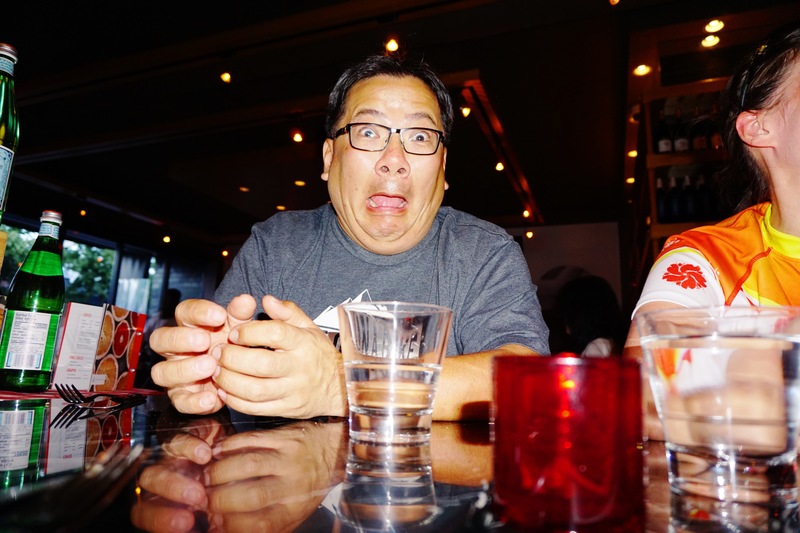 It was Father’s Day and every restaurant in Fort Bragg had a wait. 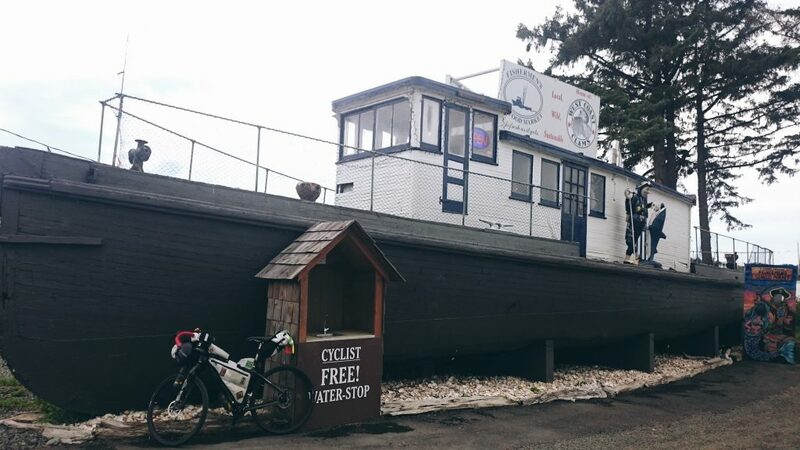 I found a diner where another touring cyclist had stopped. I asked him if he minded sharing the table, he was glad to. We shared the stories of our adventure while we waited an hour for our breakfast. I was going nuts, I just wanted to be catching up on my mileage. The other cyclist asked me when I planned to finish and was astonished when I told him my train ticket home was the following Saturday. I had 5 and a half days to make it almost 800 miles. 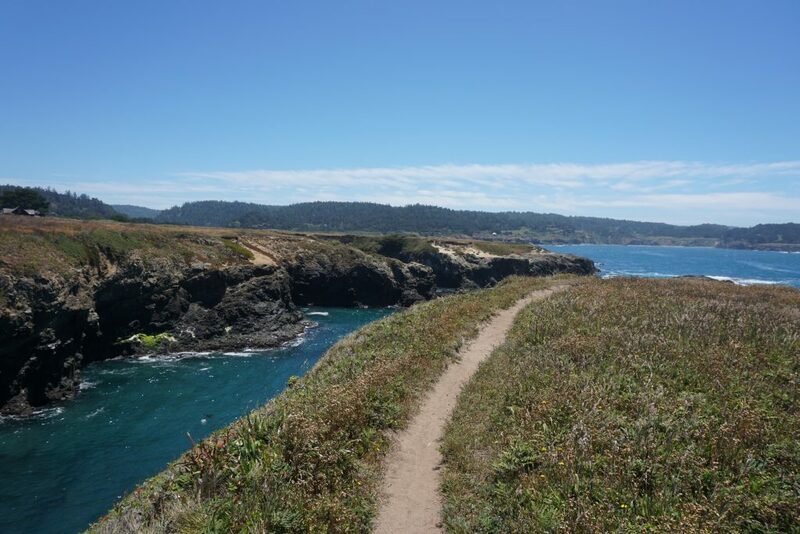 The next several pictures are all from the sandy and flat singletrack section in Mendocino. This was the hilliest day by far. No big climbs, just constant ups, and downs. It was very difficult to get in the zone and crank out the miles, all I was doing was changing gears all day. 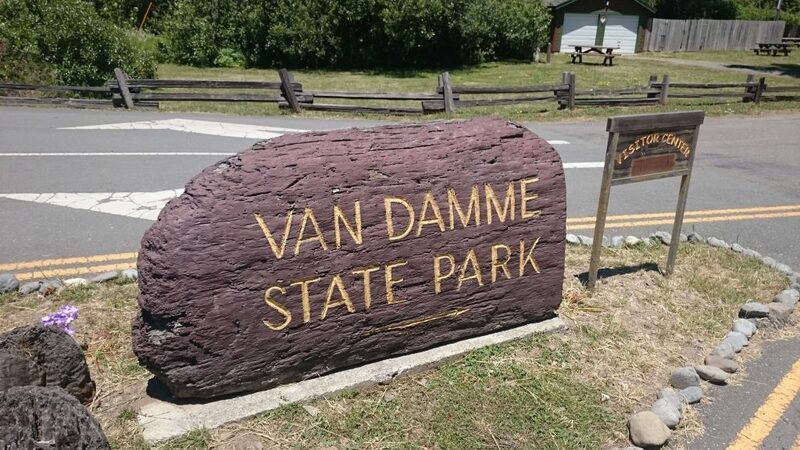 In case you were wondering, California has their own State Park for Jean Claude VanDamme, just kidding. The hills made the ride slow, but kept the views amazing. I stopped in Gualala to eat an entire pizza for dinner. I took advantage of my time waiting and restocked for the night. 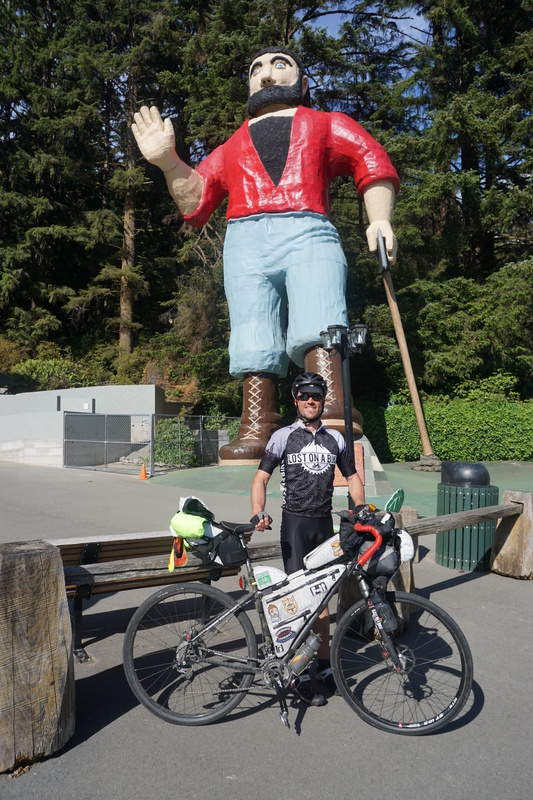 Two pretty long stops and over 9000′ of elevation gain meant a 17 hour day, only covering 138 miles. 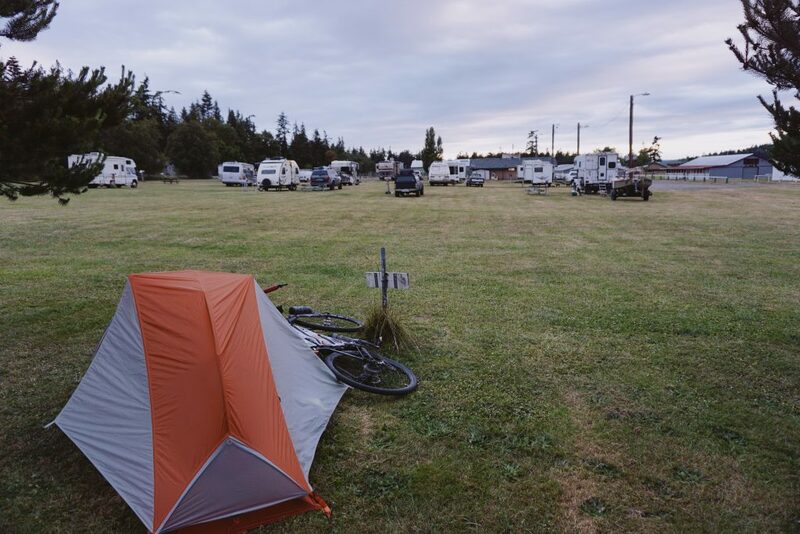 All the roadside campgrounds were full again. I just kept riding until I found one with a hike and bike area. Everyone was asleep when I got there around midnight. I was still the first one up and gone in the morning, even though I didn’t start ’til 7:30. 30 miles to breakfast warranted double French Toast, plus eggs and bacon. The waitress thought I was crazy, but I ate all of it. Good thing because it fueled me for hours. in the supposed birth place of mountain biking. The first 50 miles had plenty of good climbs, but the big breakfast was really paying off. 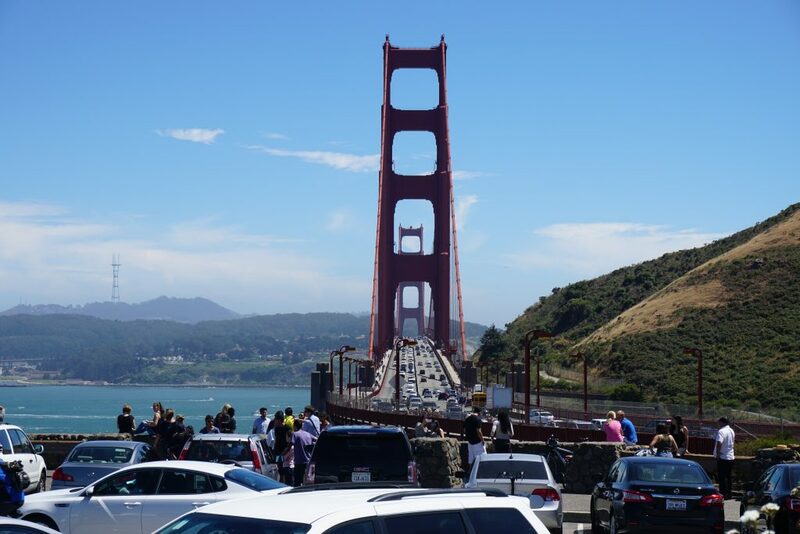 Around 3:00 I had made it to the Golden Gate Bridge. I was a little behind schedule but had been picking up the pace each day. For the most part, the bridge was mobbed near the ends, the middle was far less hectic. I was so happy to have made it this far knowing this had been my bailout endpoint. The hills through San Francisco were every bit as steep as they looked from the pictures and videos I had seen. Now that I was in a far more populated area, I had to be wise about where I would stop for refueling. I found a Chipotle just off route, usually, they have outdoor seating and big windows so I could watch my bike. The burrito really hit the spot. Perfect fuel for the evening ahead. There was a bit more of this strange dirt trail that had been thrown in nothing special, just slower than the pavement. The sun was setting, but I still had lots of distance to cover. 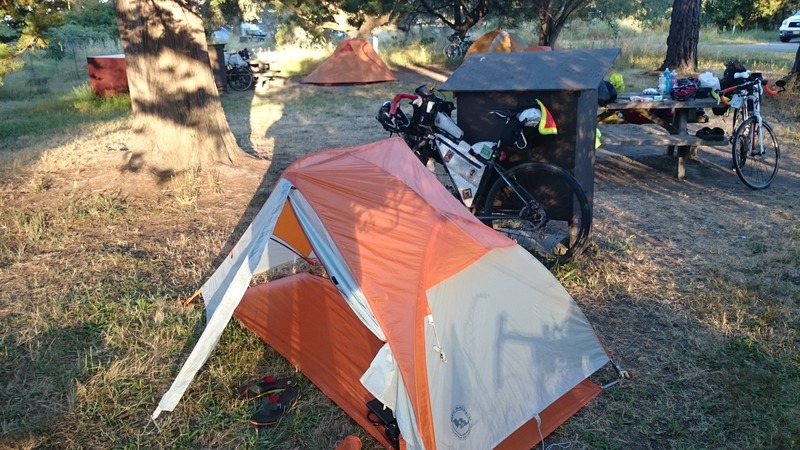 I had to be far more conscious of my planned campsites and mileage for the rest of the trip. 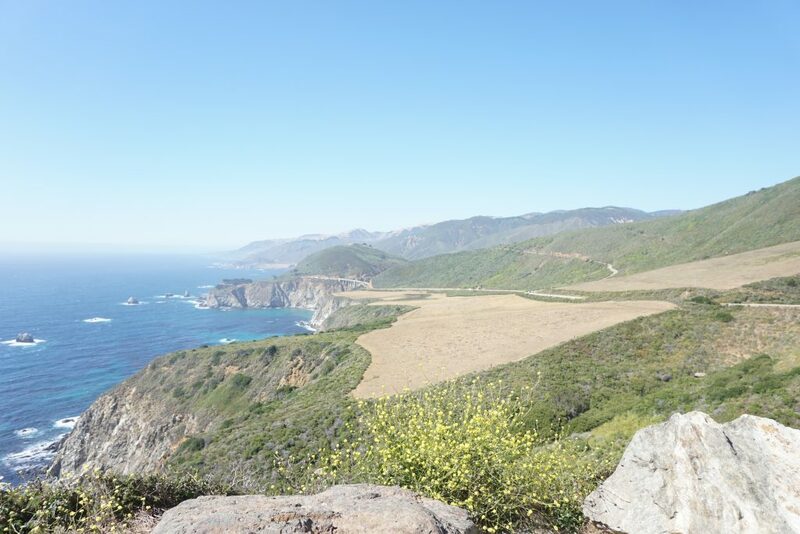 Southern California was going to have fewer camping options, and they were farther apart. 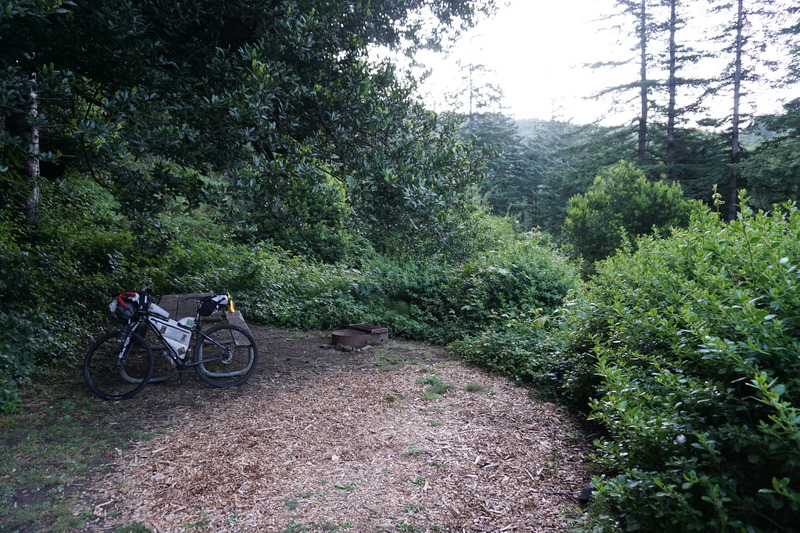 I had to make it several miles past Santa Cruz to get to the next campground. I rode until just after midnight. The kids in town must have all been hanging out along the waterfront as I passed through on my way towards Aptos. When I pulled into camp, everyone was sleeping already. I took a shower for the first time in six days. I almost slept in the handicap shower, but it was too damp. I set up just the foot print and rain fly. I woke up later than I wanted, but for some reason, I was still the only one awake. I stopped at a small bakery in Aptos to get some quick, pre-made breakfast, since I was already late, and had big plans for the day. I stopped again shortly after at a Safeway to grab some food for the road. The houses gave way to never ending strawberry fields. You could smell the fruit in the air. 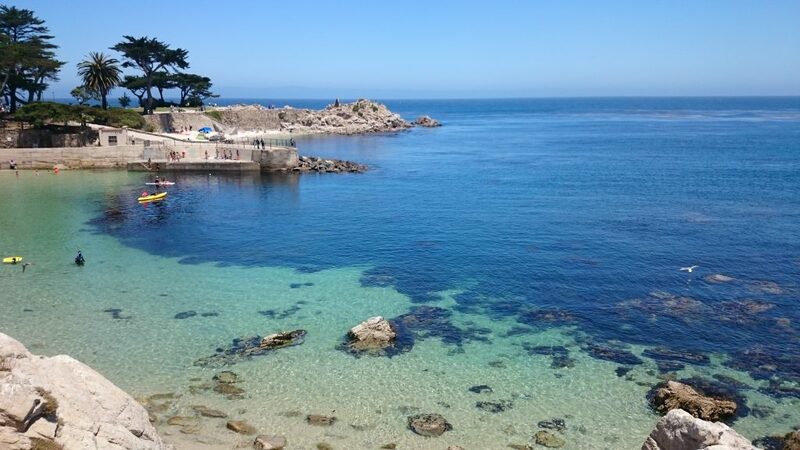 The water in Monterrey was beautiful, no time for relaxing. I probably could have enjoyed this beach for a bit, instead, into the headwind I went. 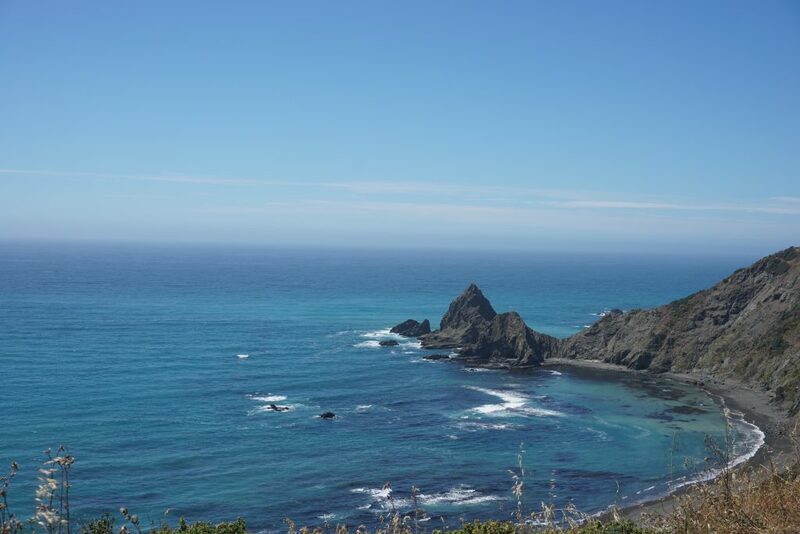 Cardiff by the Sea would be the last major stop before Big Sur. I was passing an outdoor mall when I could smell the food. I turned around to ride through the parking lot. I found a burger joint with outdoor seating and filled up. Time to head down the scariest stretch of highway everyone had been warning me about. 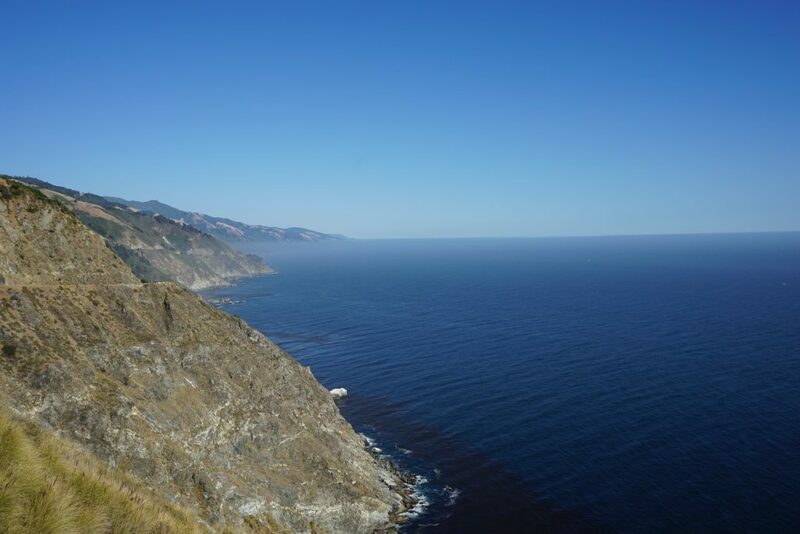 Big Sur proved to be everything I had heard, amazingly beautiful, and extraordinarily dangerous. 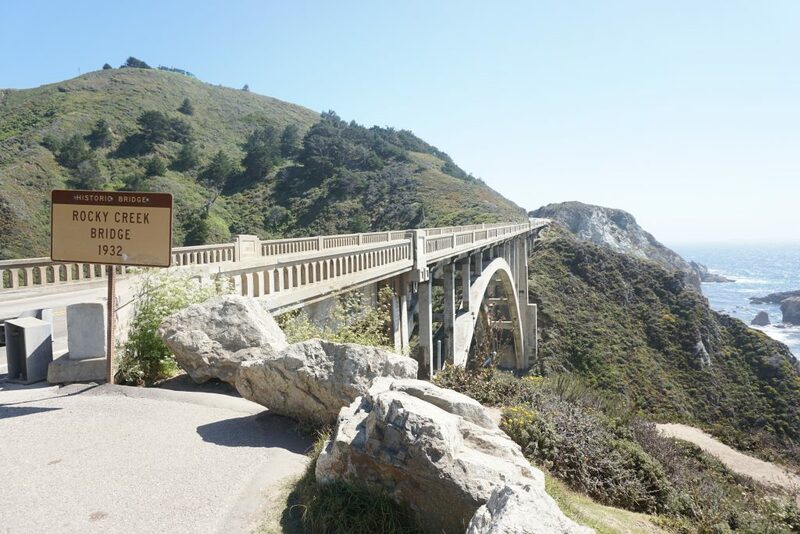 The winding cliff side roads, lack of shoulder, and distracted RV drivers made it necessary to pull off the road entirely so the caravans of vehicles could pass. 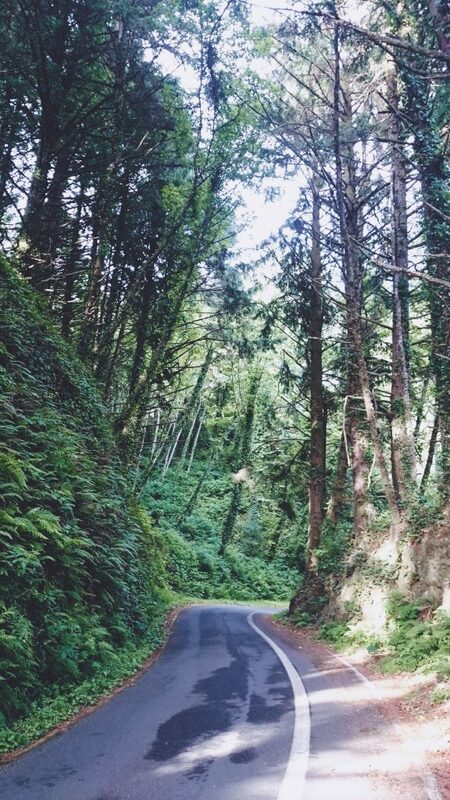 But every mile was breathtaking. All afternoon, I baked in the sun. 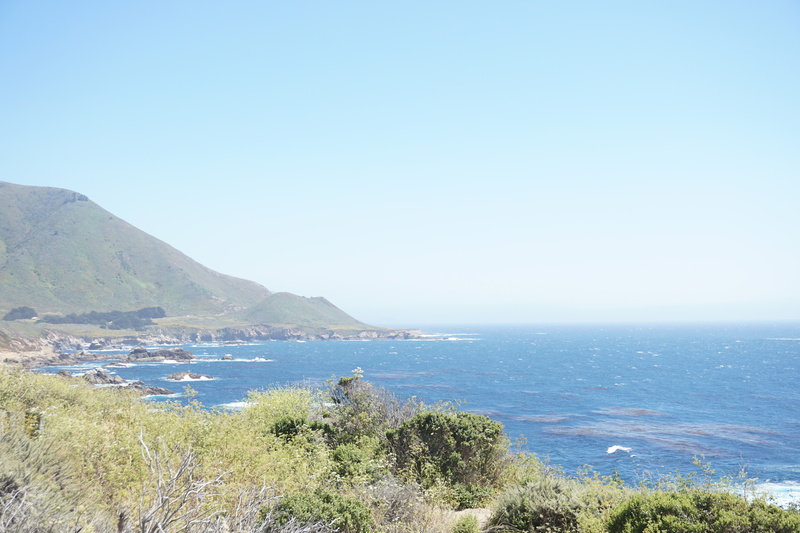 This is probably the most sparsely populated area on the California coast. The only driveways seemed to lead to celebrity quality residences, except for the few areas managed by the Forest Service, or State Parks. I am happy I made the trip when I did, as this stretch of road has seen a massive landslide since I was there. I don’t know if it was the sun or the fact that I had been on the road for 11 days, but this day was surreal. I completely felt like it was all just a dream. I was riding the coast, but the solitude was like I was in the AZ back country. I made a stop at one little store to refill for the night and I pushed on. All the campgrounds were bursting and over packed. 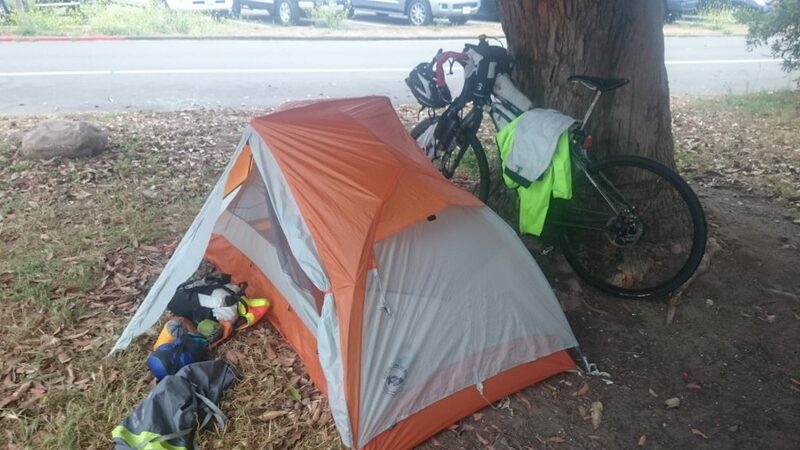 I watched two female cyclists who sounded European trying to get a place to stay at the last campsite for 40 miles. I had bigger plans to ride as far as I possibly could that day. 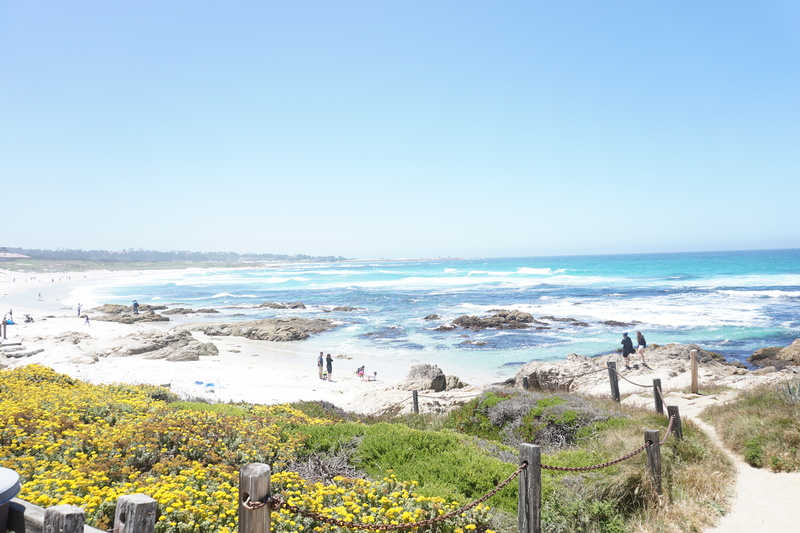 I’d have loved to make it to San Simeon. 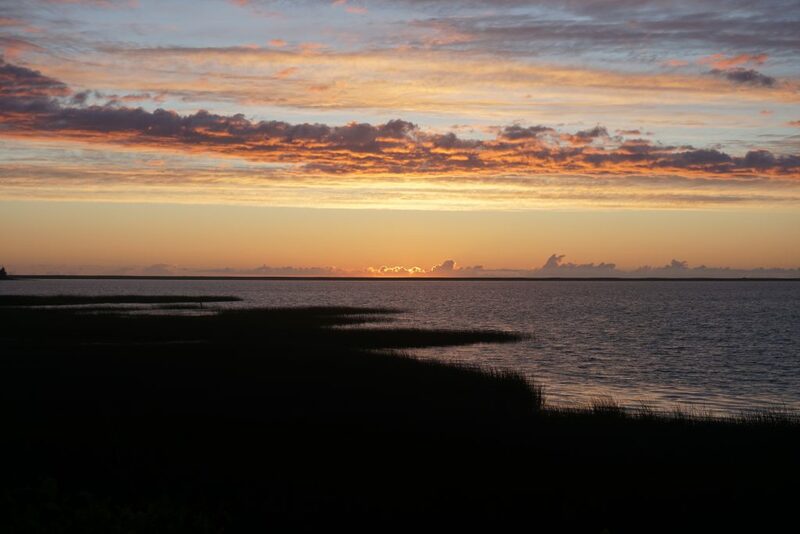 The sunset was incredible over the water, but is only a picture in my mind. One I am keeping just for me. If you want to see a Big Sur sunset, you’ll have to go there, a photo won’t do justice. Into the darkness, I rode. The farther I pushed on, the colder it got. I started looking for anywhere to pull off the chilly downhills, hoping to find anywhere better than the ditch I saw a couple other cyclists sleeping in. At almost 12:30, I was just too cold to continue, There was a barbed wire fence to the right, but every once in a while, some wood steps to get over it. 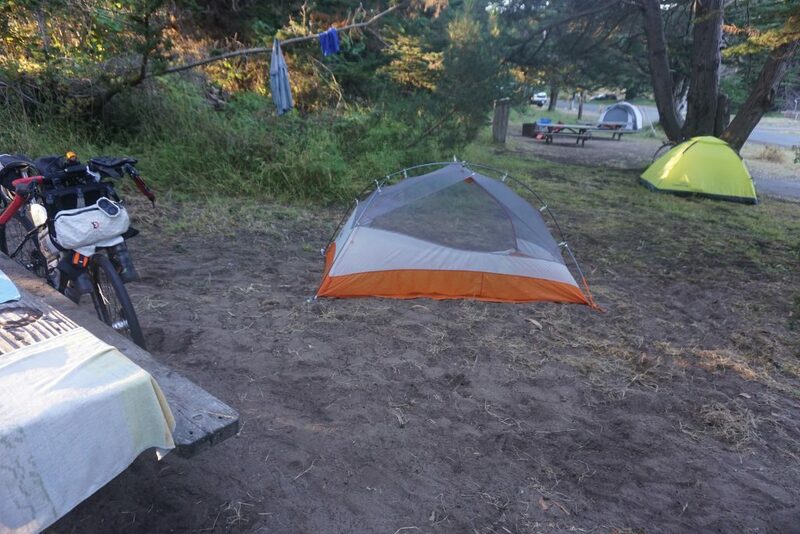 I stopped at one, ignored the no camping signs, stepped over the fence, and set up my tent hiding in the coastal shrubbery. When I woke up, the tent was wet with ocean spray. I could hear strange sounds, banging, then like a lion purring. I couldn’t possibly imagine what would be making the noise. I packed up my gear, hopped back over the fence, and rode towards the noise. 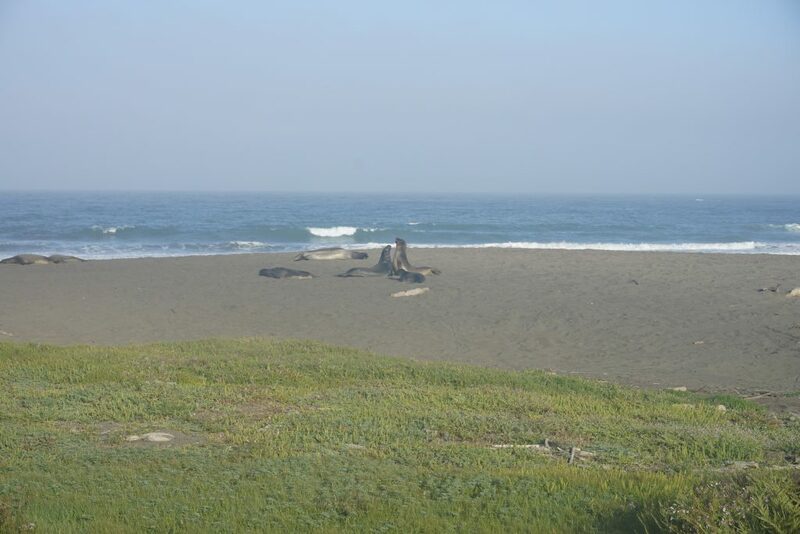 Elephant Seals were fighting all down the beach less than 100 yards from me. The banging noise was them banging their chests together. I had some serious catching up to do now. 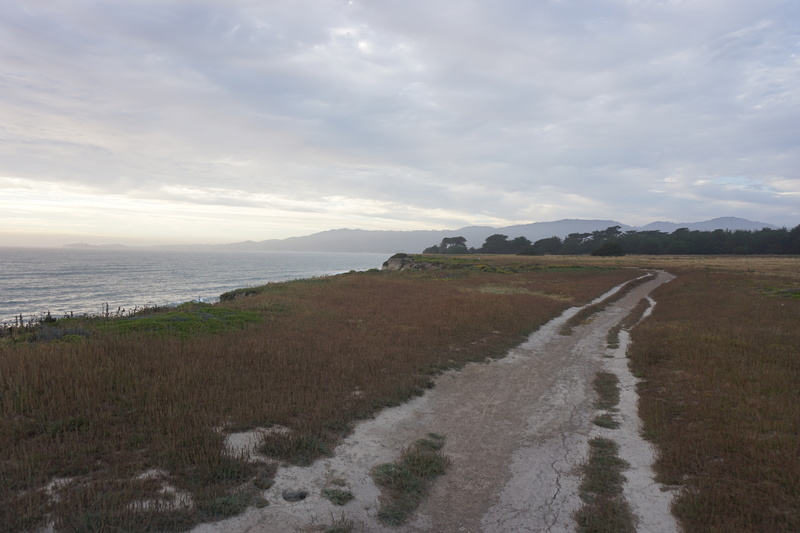 Falling short of San Simeon meant I would have to ride farther than any other day. I had eaten some of my breakfast the night before, making the ride to Cayucos a hungry one. 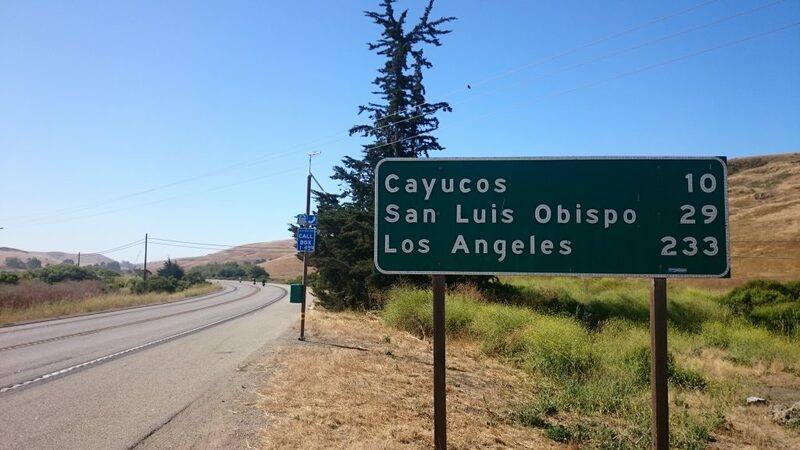 My friend Jeff had moved to Cayucos from Prescott, so I sent him a message from this sign. He replied back he was working in Morro Bay that day and gave me instructions on where I could meet him. I stopped at a little grocery store in Cayucos to pickup a bunch of mobile calories. I’d have to pedal almost all day to make the goal. 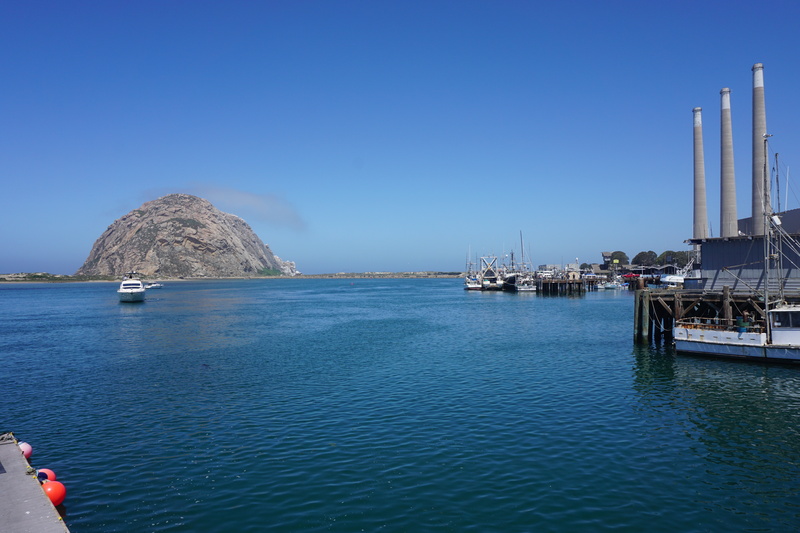 I hit Morro Bay near 11:30, and had a brief chat with Jeff. He asked where I wanted to stop that day and gasped when I told him I was going to make Carpenteria, 140 miles away. He said I’d better get going, I didn’t argue. 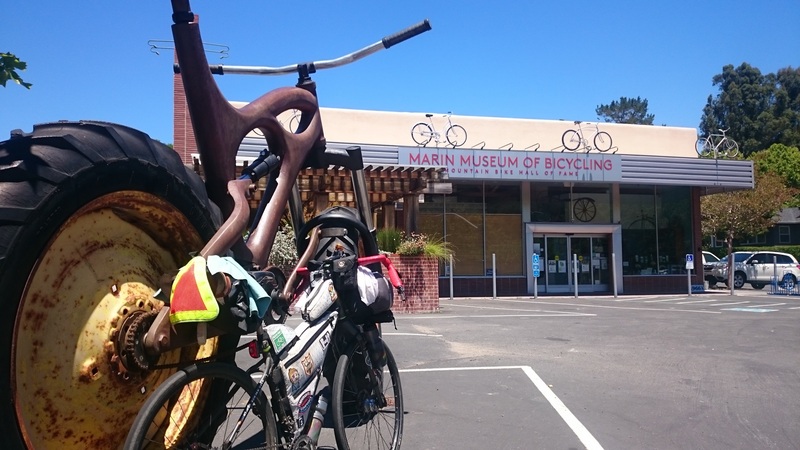 Except for a stop in Pismo Beach to eat a whole pizza and dry out my camping gear, I spent the rest of the day pedaling away. The miles just ticked off, I ate in the saddle all day, cookies, candy bars, and combos. As darkness approached I could see the longest climb ahead Only 1000′ gain over almost 20 miles, I could keep the speeds up. I had a whole lane’s width shoulder to climb up in the darkness. I pulled into a McDonald’s around midnight and ordered an iced coffee with extra espresso and two apple pies, I was going for it. My wife sent me a text, calling out the apple pie stop. She wanted to know what the hell I was doing still going strong that late when I had already covered 150 miles. I explained, there’s no stopping now, the next campsite is still 30 miles away. With a sugar and caffeine fueled 15 mph average for those 30 miles, I was at camp by 2. My biggest touring day ever, 179 miles in just under 19 hours, not bad for day 12. Of course, I was going to sleep a bit after that day, I had one guy beat me out of camp. He was quick too, It wasn’t like he was touring, it was like he just stayed the night there, woke up, had to get to work, and he was already late. I took my time packing up and found the closest French Toast dispensary I could. 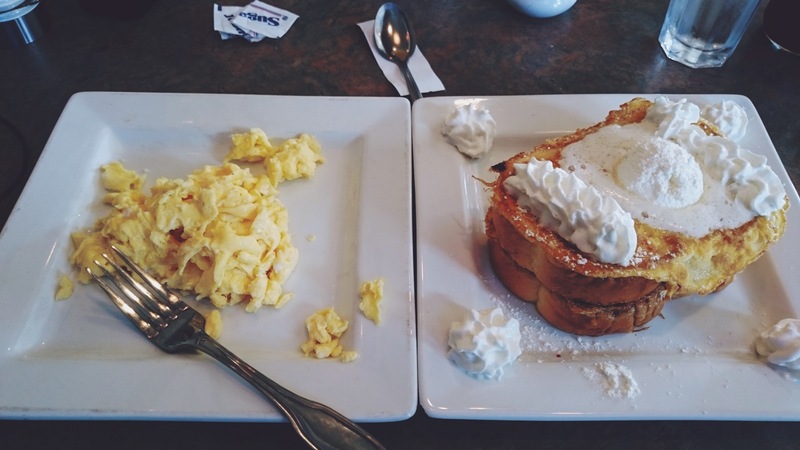 Some how, the SoCal French Toast just wasn’t quite as good as it had been to the north. 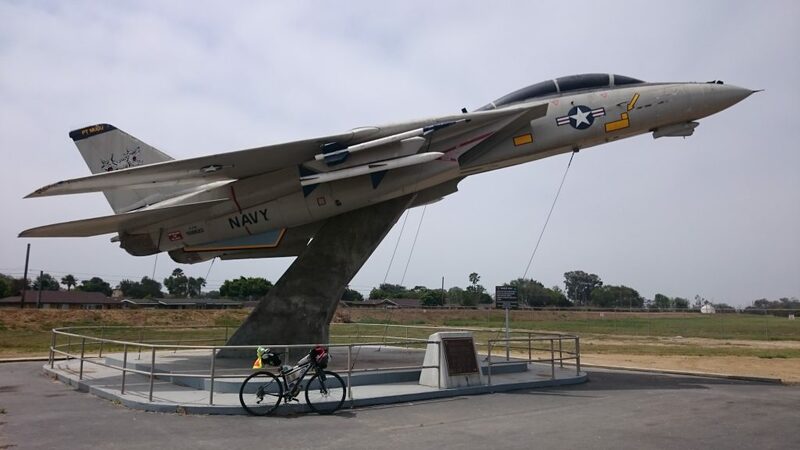 After breakfast, I found this fighter jet at Point Mugu Naval Air Station. I saw hundreds of surfers that day. 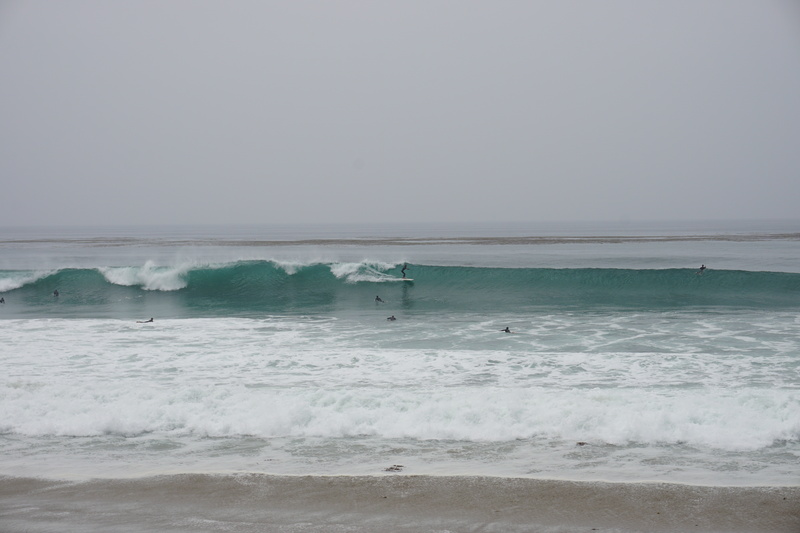 Kids at surf camps galore. More black specs in the water than you could count. 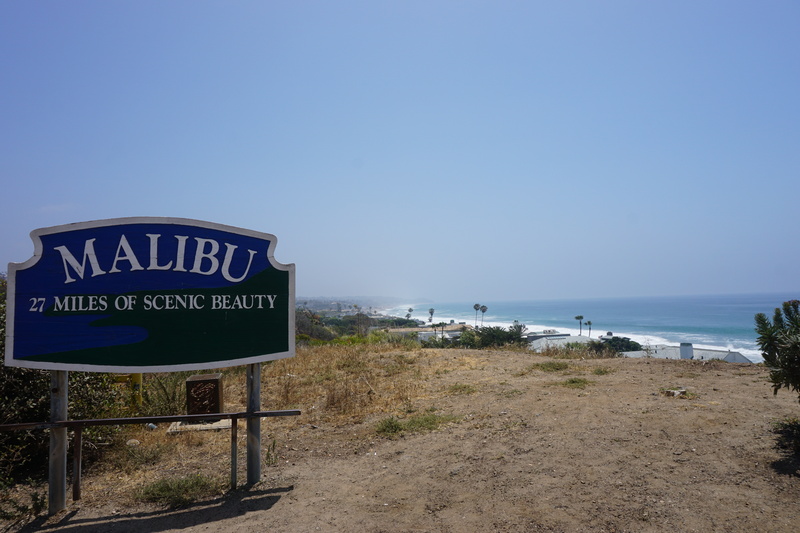 I don’t know what I expected Malibu to be like, but it was nothing to write home about. Where the earlier days had passed through so much sparsely populated countryside, the rest of Southern California was all man made. There had been thousands of miles of scenic beauty, not sure what this sign means. Santa Monica Pier’s attractions just couldn’t compare to a redwood forest of giants. 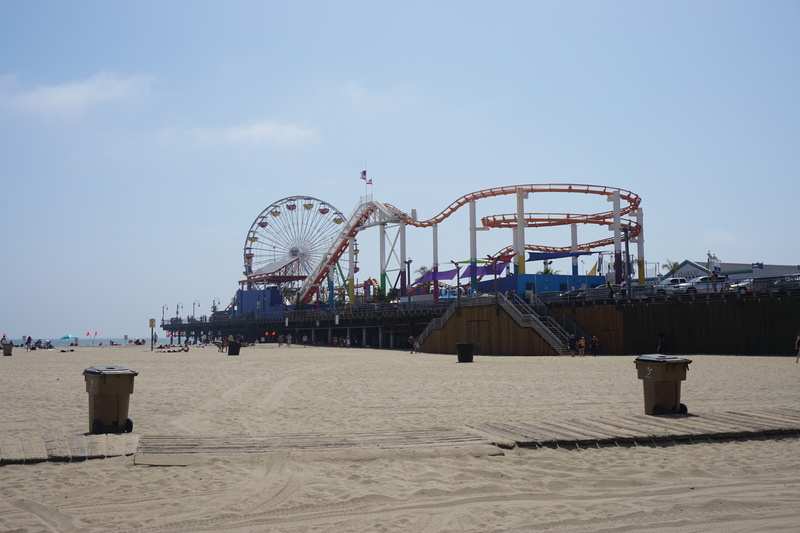 I rode the winding beach paths with all the runners, cyclists, and inline skaters. 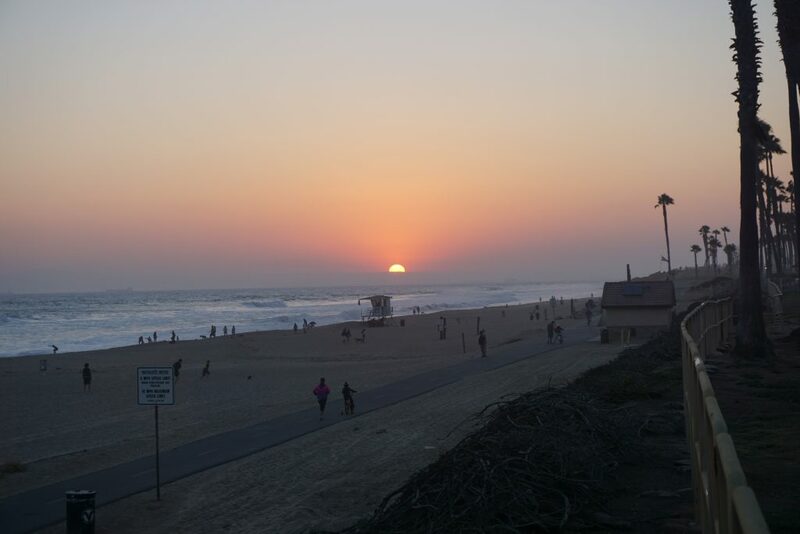 I passed Venice Beach, Hermosa Beach, Long Beach, Huntington Beach, the list goes on. They had nothing on that remote beach in Oregon or Washington, with no one on it but the animals that lived there. An almost flat day saw 150 miles fly by. I made it to Dana Point around 9:30, well after the camp host was gone. I found a little spot behind the shower house to hide. This was the last night of the trip, so I put all my shower tokens in the shower and enjoyed every last minute. I had pushed so hard the last few days I only had to make it 90 miles on the last day. This was all a well-calculated plan to make sure I’d get to eat at a good restaurant upon finishing. As I packed up, a guy from the site next to me startled me, asking what I was doing, as if I was rifling through someone else’s stuff. 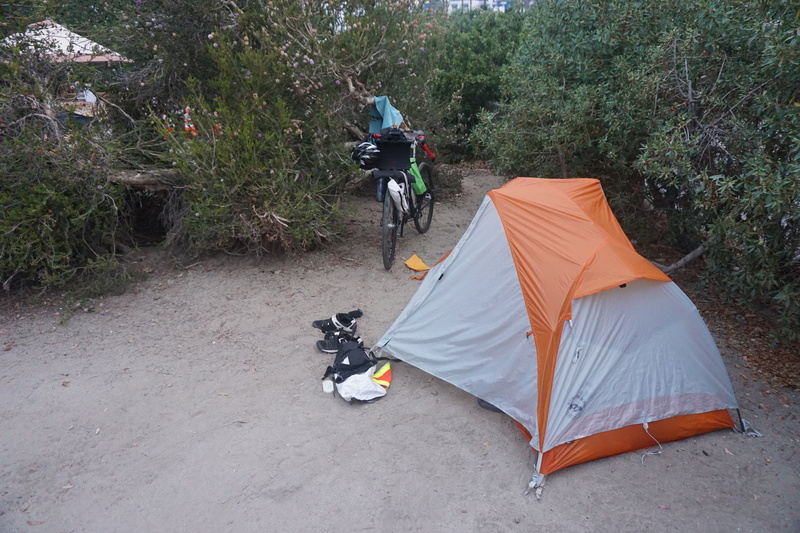 I explained I was camping there because I was on a bike and had nowhere else to stay. He just shrugged and walked away. I believe they call the weather that morning June Gloom, aka overcast. I had preregistered as a visitor for Camp Pendleton and went through security no problem. After making my way through base, I was in Oceanside where I found myself at the same spot I was at when I decided this would be my next big adventure. 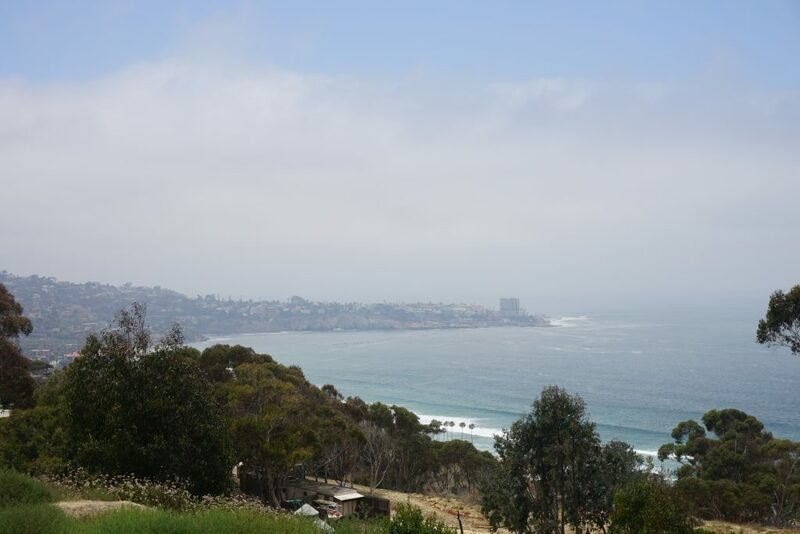 Only one little climb all day, up to Torrey Pines, one last good look at the cityside. There was no sense of urgency all day. I knew I had to finish, but the ride had been so amazing, I didn’t want it to end. 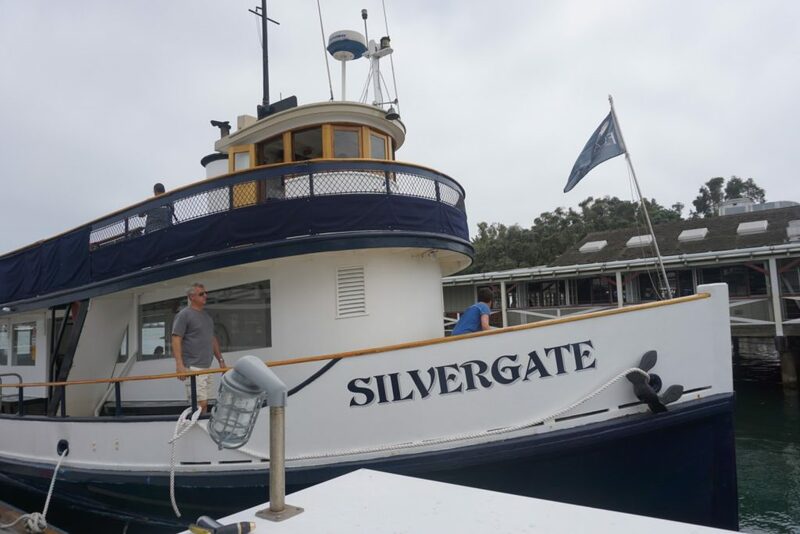 I made my way to San Diego where I was going to catch the ferry to Coronado. I could have taken the road, but I thought since I took a ferry the first day, it would be fitting to do the same on the last day. 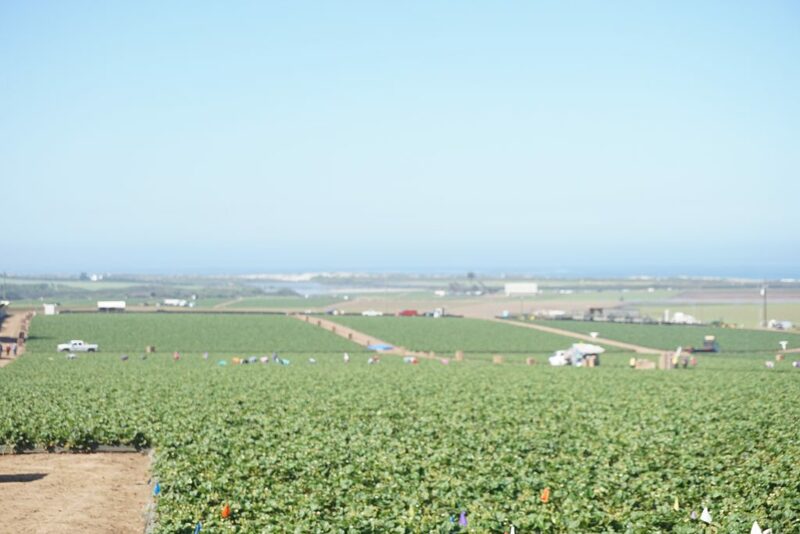 I wanted to get as close to the border as possible when I finished and Google Maps automatically mapped my route around Imperial Beach and straight to Border Field State Park. The roads leading up to the park reminded me of when my family had lived in Vista, CA. The park was closed to car traffic, the whole place run down and forgotten. My friends Matt and Angela came from Oceanside to pick me up, they were waiting for me with beer as close to the end as they could drive. We said a quick hello-goodbye since I only had a little farther to go and I’d be right back. Not the spectacular finish you have going on in your mind. Not saying I was expecting anything but a fence, but in my mind, there was a party. When it really came down to it, it wasn’t the finish line that was sweet, it was the journey, and all I had just been through. After the ankle issues early on, it was overwhelming to know I had pushed through and made it on schedule. 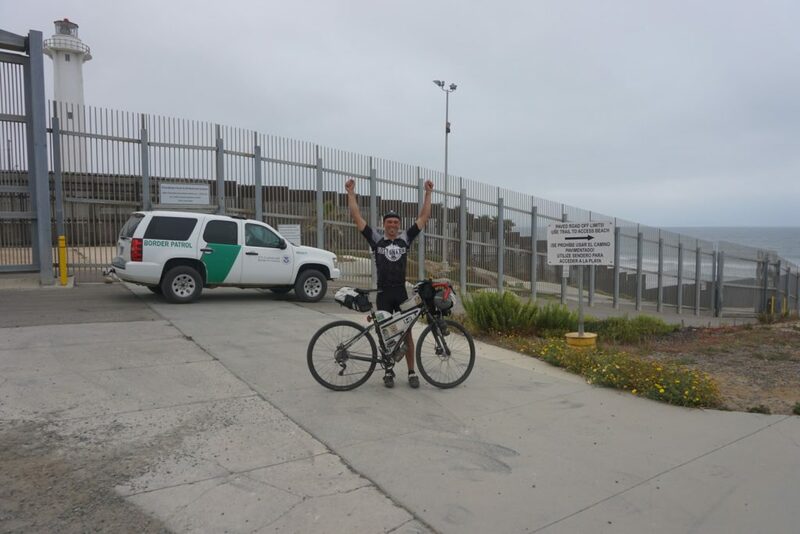 There were some people at the border on a walk, I asked them if they’d take my picture, they obliged and asked where I was riding from. I loved the look on their face when I said Canada. 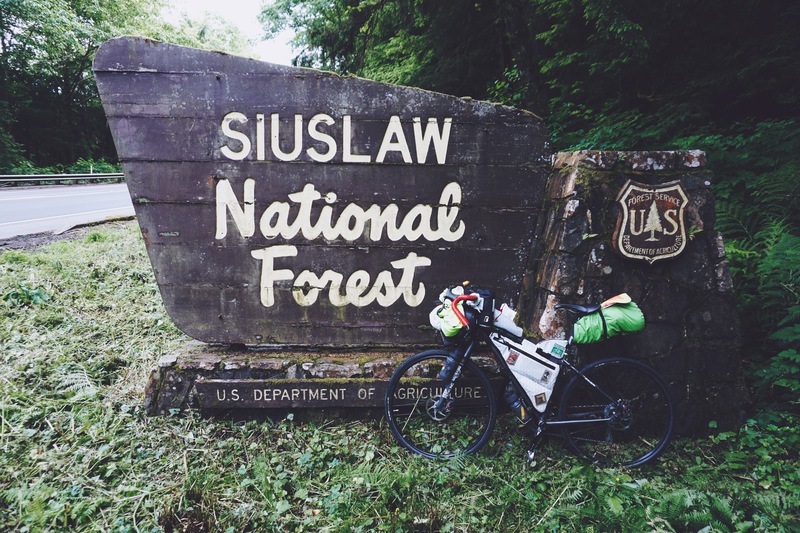 1905 miles, 83,000′ gain, 13 days 11 hours. I had to ride back to where Matt and Angela were waiting for me. We celebrated with my first beer since Vancouver. How sweet it was. I had missed some messages from my friend Francois trying to get me in touch with his friend in Imperial Beach. They had thought I’d be riding right down through the main beach area in town, but my route went around town on the back roads. My friends were kind enough to drop me off for a beer in Imperial Beach. I had missed the Mayor, but I at least got to share a bit of the story with Francois and Deborah’s friend. After the beer, it was time for dinner at Claim Jumper in Carlsbad. Spinach and artichoke dip, a tri-tip dip sandwich and fries were gone as fast as they were dropped off. After Dinner, we went to Matt and Angela’s so I could take a shower and a coma. The next day, Angela made my last French Toast of the trip, a close second to berry and cheese filled French Toast I had the day I almost quit. This time in Oceanside, my left hand was too numb to ride the singletrack, but never too numb to ride to Chic-Fil-A for lunch. The clock was ticking down, so I headed off to the train station. The train from Oceanside to LA had a bicycle car. 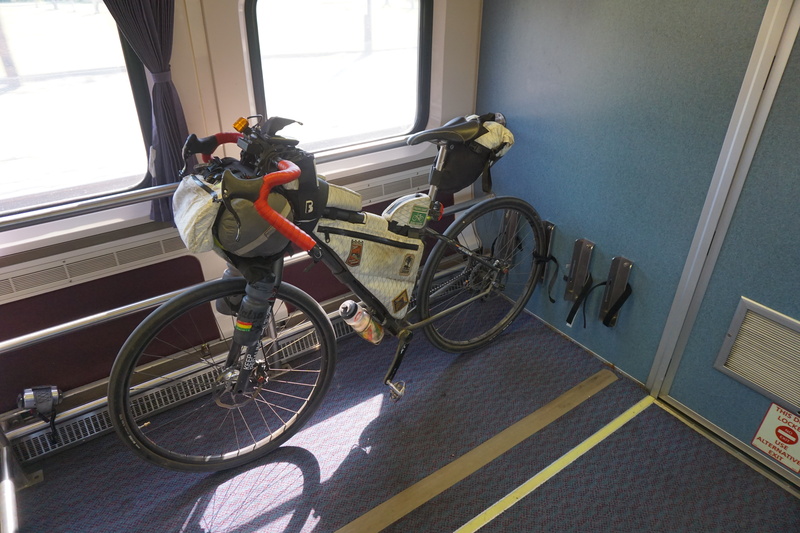 Once at the station in LA, I had to disassemble the bike part way so it would fit in the bike box Amtrak supplies. After boxing up the bike, I headed over to a bar near the station and ordered the most expensive single can of PBR I had ever purchased. The train from LA leaves around 6pm, and arrives in Flagstaff around 4:30am. I tried to sleep, but there were plenty of crying babies to keep that to a minimum. 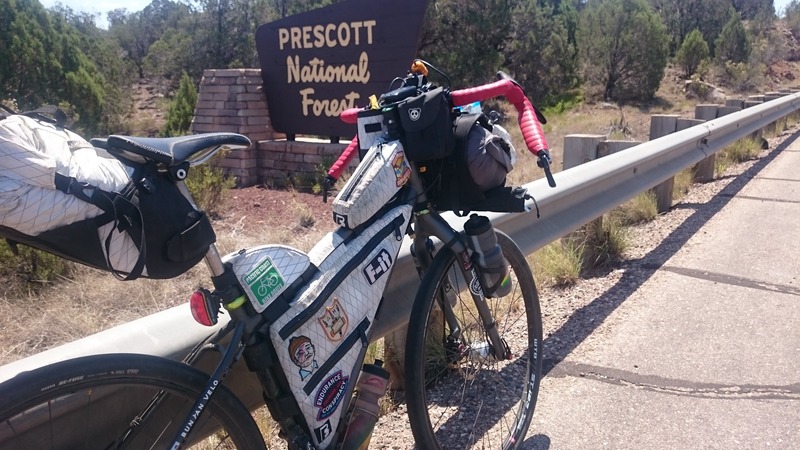 When I got to Flagstaff, I reassembled the bike and rolled to the closest gas station to refill for one last time on the ride back to Prescott. 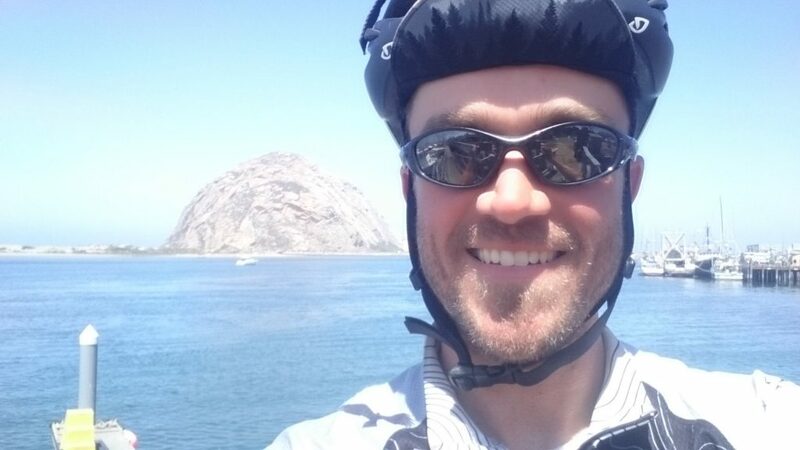 The temperature was over 100, but much of the ride was downhill, which led to my fastest century of those two weeks. I was home by mid afternoon, Sarah and the kids were out of town, I took a shower and met several friends at Park Plaza for dinner and beers to celebrate my return and hear some tales from the road. Thanks again to everyone who supported me on this trip. Knowing all of you were keeping an eye on me and cheering me on made a world of difference when the going got tough. The months after this trip were pretty dark for me. I could hardly cycle due to hand numbness and once I could ride, I ended up getting injured and having an internal bleeding episode of my own. I looked into the post-epic depression I was dealing with and it turns out, many through hikers and cyclists deal with the same thing after completing a huge life goal adventure. After the solitude of one’s mind for so long, it changes your perspective on the world and what we are doing with our lives. All I could think was if only I could get them to understand what it felt like to put myself out there. Then there’s this, now what, that goes through your mind over and over. 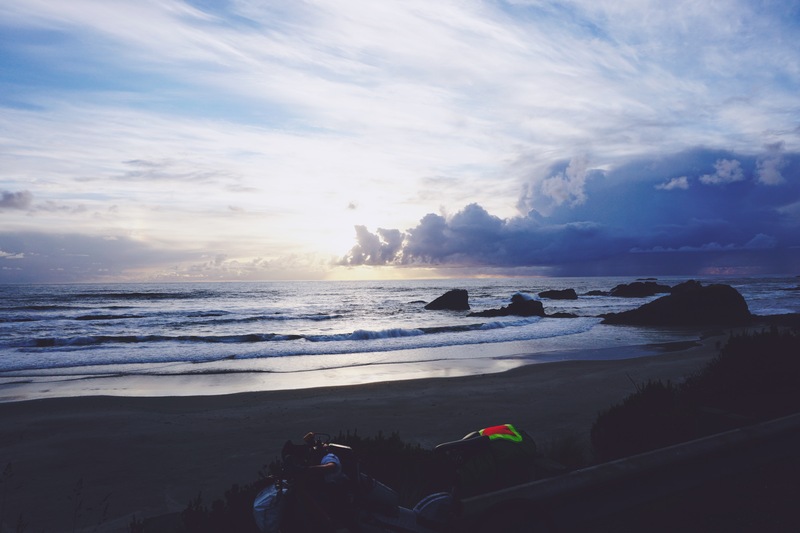 These feelings compounded by everyone else asking you the same thing, now what? Well, 6 months later, I quit my day job to pursue my passion for helping people with computers and mated it with cycling by making all house calls and pickups by bike. 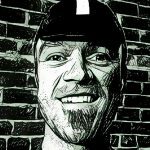 I am committing to the Tour Divide race in 2018, and I am training to complete the ride in 21 days. I will be putting more effort into providing you all with better content, and hopefully inspiring more of you to get out and see just how far you can go. Thank you for reading this, I hope it was worth the wait.